What is the connection between "Dr. Who", "B" Cowboy stars Gene Autry and Ray "Crash" Corrigan, Bela Lugosi, Doug McClure, Kenji Sahara, the Kaiju's known as "Gojira" and "Gamera" and "Captain America"? Those answers await my reader. In 360 B.C. the Greek Philosopher Plato first mentioned "Atlantis". According to legend, or not, there were actually three great continents that between the current land masses. They were "Atlantis" located in the Atlantic Ocean, "Lemuria" located partly in both the Indian and Pacific Oceans and "Mu". Which was located either in the Pacific, or Atlantic Oceans. Depending upon whose version you read. I will get into that discrepancy later. Did these LOST CONTINENTS exist? Who knows for sure, but remnants of civilizations have been found under the three oceans I have mentioned. Where any of these sunken remains part of an advanced civilization that at some time in the past sunk to the bottom of those oceans? Based upon the tales of their destruction. The events, if it did occur, might have been during the Biblical Flood told in the "Old Testament" story of Noah?
. The dating of catastrophic flood events in different countries and civilizations. Seems to keep the different stories within a 150 year time period of each other. As archaeologists did the dating by translating ancient texts or artifacts, if my reader takes into consideration human error. The dating for comparison may be actually either closer, or later in time. The following is a map recreated to show the world as if all three continents are in place. This map places "Mu" in its more traditional Pacific Ocean location. The map comes from the website "Factual Enlightment"
Mention the topic of lost continents and most people would immediately mention Plato's creation. Plato first mentions "Atlantis" in his "Timaeus" and tells his reader more in the "Critias". The actual ancient Greek words for the continent are Ἀτλαντὶς νῆσος or the "Island of Atlas". Actually the Atlantic Ocean means "Sea of Atlas". So the Titan becomes directly related to the lost continent in two specific ways. Below the main city of "Atlantis", as described by Plato, was constructed in concentric rings. The location of the continent changes on some maps. One ancient map, date unknown but referenced many times, is a little confusing. America is to the right of "Atlantis" and Southern Africa to the left. This would work if what is labeled "America" was actually "Australia", but that would also meam "Atlantis" was in the Pacific Ocean. The map maker contended the lost continent was in the Atlantic Ocean though. As I mentioned there will be a similar mix up on the location of "Mu". Then there is this interesting map, It implies that Atlantis and South America are one and the same. Thereby tying the continent more closely with the Aztec and Mayan civilizations. Although North American is incomplete and based only upon the knowledge at the time by the map maker. 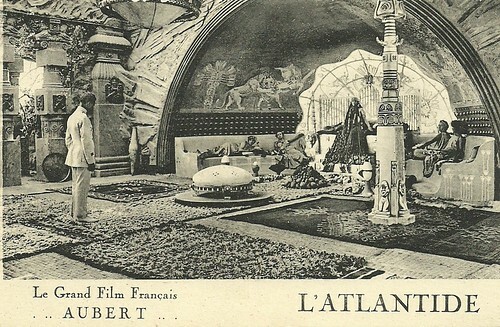 The first motion picture about Atlantis was a French and Belgian co-production from 1920 based upon a novel of the previous year by French author Pierre Benoit "L'Atlantide". The novel tells of two French Officers who get lost on patrol in the Sahara Desert and discover the remains of the Atlantean civilization ruled by a queen named "Antenea". 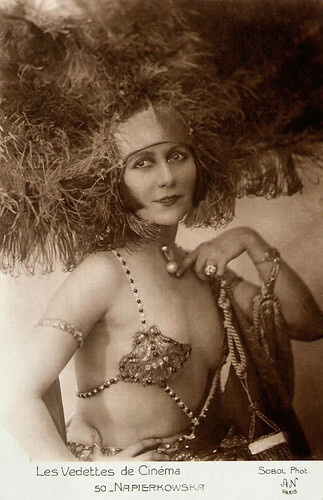 She was originally portrayed by Stacia Napierkowska seen below. The plot of Benoit's novel sounds extremely similar to H. Rider Haggard's "SHE". First released in October 1866 as a chapter serial in "The Graphic" Magazine. Haggard tells of "Ayesha" Queen of the Lost City of Kor in the Arabian desert. Where two adventures discover a civilization that predates the Egyptians. Just as in "L'Atlantide". In 1932 a French and German co-production of Pierre Beniot's novel was released. The film, as was the practice prior to dubbing, was shot with a French cast, a German and an English language cast. What did not change in all three films was the actress portraying "Antinea". While the other roles were different actors of the respective languages. Actress Brigitte Helm should be known by all students and fans of German director Fritz Lang. She portrayed both "Maria" and her Robotic copy in Lang's 1927 masterpiece "Metropolis". 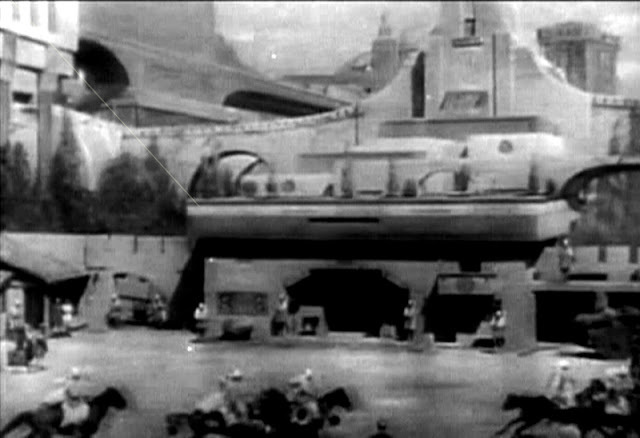 As with the original silent film this 1932 three picture production was actually shot in the Sahara Desert for reality. The United States would make a version of Pierre Benoit's novel. 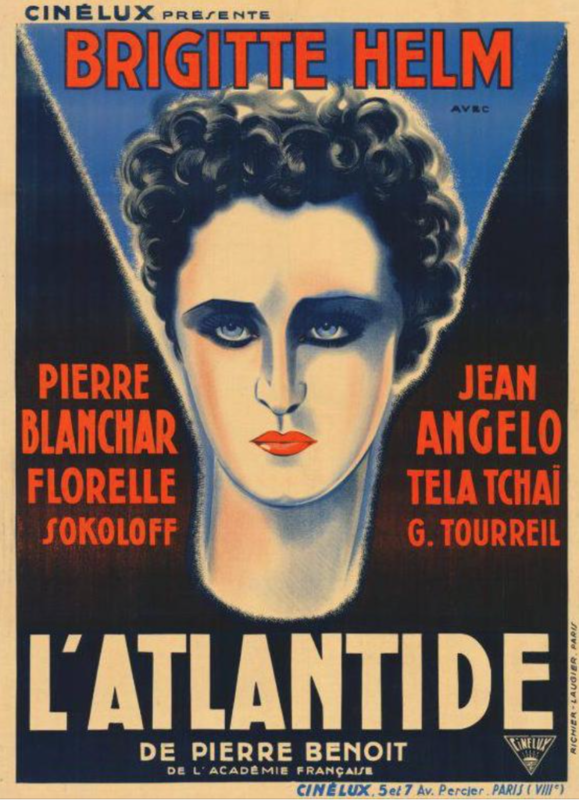 That film was released in January 1949 under the title "Siren of Atlantis" aka: "Atlantis" aka: Atlantide". 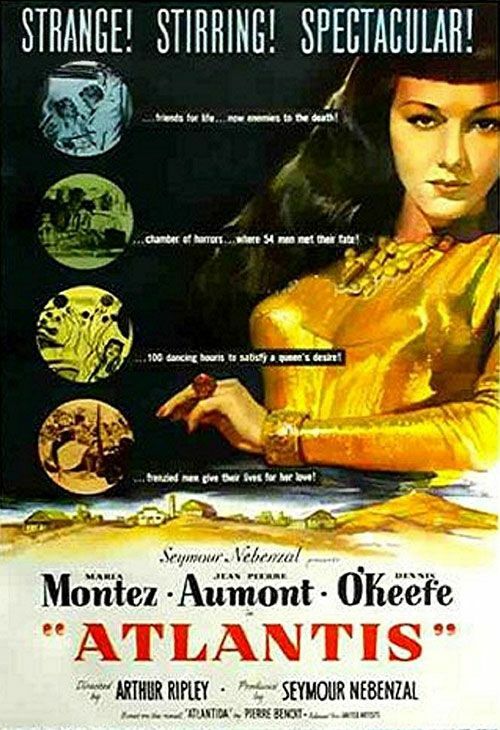 The production starred Maria Montez as "Queen Antinea" and her husband, at the time, Jean-Pierre Aumont as "Andre St. Avil", The lost city was moved from the Sahara Desert to an African Jungle. This was a typical Hollywood Maria Montez motion picture and very similar in style to the one's she had done opposite Jon Hall. Such as 1944's "Cobra Women", or 1945's "Sudan"..
On May 30, 1936 Republic Pictures released a 12 Chapter serial about "Atlantis" entitled "The Undersea Kingdom". The hero of this adventure is called "Ray Crash Corrigan". He was portrayed by an actor whose real name was either Raymond Bernard, or Raymond Benitz depending on which biography you read. Actually starting with this serial Raymond adopted and legalized his character's name as his own. From this feature forward he was Ray "Crash" Corrigan in motion pictures. The obvious here was that Republic, by calling their character "Crash Corrigan", was playing off Universal Studio's serial "Flash Gordon" released only one month earlier. Even to the extant of having the two hero's names sound similar. Between September 22, 1936 and August 10, 1939 Ray Corrigan portrayed "Tucson Smith" in Republic's "B" Western Series "The Three Mesquiteers". He was in the first 24 of 51 movies that made up the popular series with some changes to actors in the other lead roles.. Portraying the second "Mesquiteer" "Stoney Brooke" during this period were actors Robert Livingston and John Wayne. While the third "Mesquiteer" "Lullaby Joslin" was Max Terhune. In 1937 Corrigan would purchase land in the Santa Susanna Mountains. The area joined the San Fernando Valley and is now considered part of Simi Valley. He would turn his ranch into a Western movie and television location named "Corriganville". In 1958 the actor portrayed the title character in the low budget Science Fiction film "It, the Terror from Beyond Space". 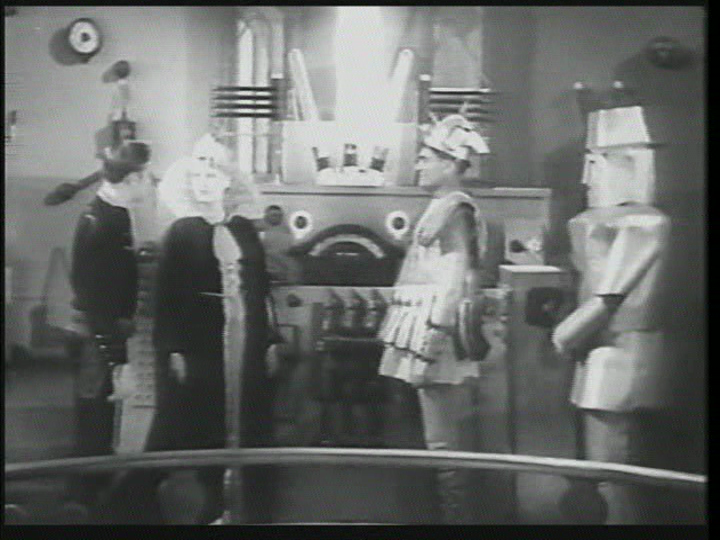 Below Corrigan is on the left in a scene from "Undersea Kingdom". The plot of the serial has Naval Lieutenant "Crash Corrigan" invited to visit "Professor Norton" portrayed by C. Montague Shaw. Shaw appeared as "Dr. Huer" in the 1939 serial "Buck Rodgers" and was also in "Flash Gordon's Trip to Mars" In this serial "Professor Norton" has invented a device that at short range can both detect and prevent earthquakes. A series of quakes has been occurring across the World in areas they shouldn't appear in. They also appear to be originating from an area of the Atlantic Ocean that Plato wrote the continent of "Atlantis" was to have existed. At the "Professor's" demonstration is a reporter for the Times named "Diana Compton" portrayed by Lois Wilde. Can you say Republic's answer to "Dale Arden"? Wilde was only in 19 movies and most were "B" Westerns. "Diana" will of course accompany "Professor Norton" and "Crash Corrigan" in a rocket submarine to "Atlantis". Far right are C. Montague Shaw and Lois Wilde. 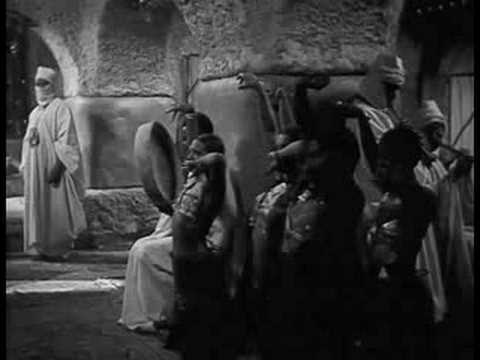 Sitting on the throne is actor Monte Blue as "Unga Khan". Can you say "Ming the Merciless"? As both "Flash's Ming" and "Crash's Khan" are patterned after ancient Chinese warlords. 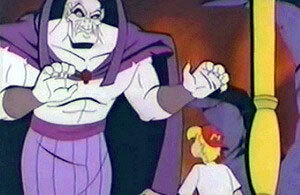 "Unga Khan" is the tyrant ruler of "Atlantis" and leader of the group known as the "Black Robes". Blue started out in silents as a leading man to both Gish sisters, Gloria Swanson, Clara Bow and Norma Shearer. He was a favorite of both D.W. Griffith and Cecil B. DeMille. In the early 1950's Monte Blue moved to television Westerns normally playing a Sheriff. His shows included "Sky King", "The Lone Ranger", "The Adventures of Rin Tin Tin", "The Adventures of Wild Bill Hickok", "Annie Oakley" and "The Life and Legend of Wyatt Earp". Fighting the "Black Robes" where, of course, the "White Robes". They are lead by "Sharad" portrayed by William Farnum seen sitting at the table. From 1915 to 1925 William Farnham was one of the highest paid actors in Hollywood. Earning him a weekly salary of $10,000 dollars. That may not seem like much today, but in 2018 that equates to a weekly salary of $142,280 dollars. The cast of the "Undersea Kingdom" included Lester Alvin Byrnette known to "B" Cowboy film buffs as "Smiley" Burnett. He portrayed one of "Professor Norton's" submarine crew "Briny Deep". As a "B" Cowboy side kick, "Smiley" would ride the range along side of Gene Autry, "Sunset" Carlson, Charles Starlett aka: "The Durango Kid" and Roy Rodgers. He reappeared with Autry on his television show and was a regular on both "Green Acres" and "Petticoat Junction". Burnett was also a song composer and inventor. Along with being able to play over 100 different instruments. All I could locate about Frankie Marvi seen above, with Burnette, as crewman "Salty". 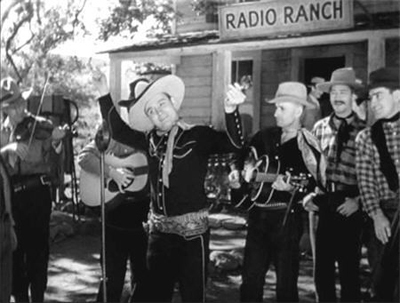 Is that Marvin was a musician, but appeared in both "B" Westerns and Western television shows from 1934 through 1965. Having a juicy role as "Unga Khan's" main henchman ""Captain Hakur" was Lon Chaney. Jr. Although he had been in 15 motion pictures prior to "Undersea Kingdom". This was only the second time Creighton Tull Chaney was billed as Lon Chaney, Jr.
As with every cliff hanger serial since the silent era this one is packed full of excitement. This "Atlantis" is in a complete undersea world with air to breathe, a sky and to all appearances seems to be exactly like the surface world. Below is one of "Unga Khan's" "Vol Planes" as it approaches his tower fortress. Then there are the robots that "Crash" must do battle with. 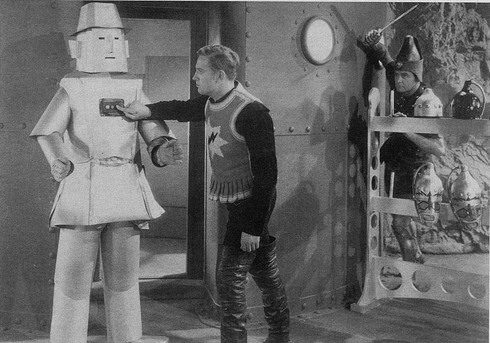 This was also the first appearance of the classic Republic Robot that appeared in many other chapter serials from the studio. 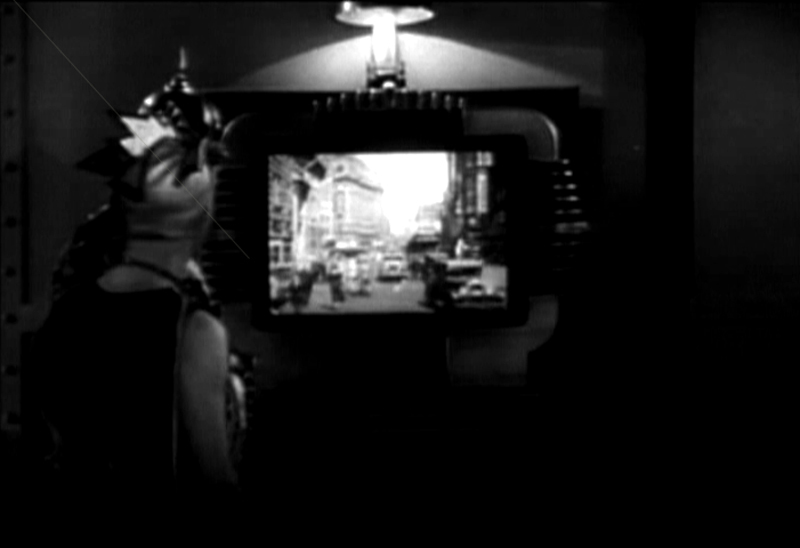 Below a 1936 television viewer with the ability, don't ask how, to see the surface world. The hero in distress sequence. "Crash" is chained to one of "Unga Khan's" Juggernaught tanks..
A look at "Atlantis" in the "Undersea Kingdom". In the end "Unga Khan" will be defeated and peace restored to "Atlantis". While "Crash" and company return to the surface and he lives happily ever after with "Diana". It would be another 23 years before "Atlantis" resurfaced, maybe the wrong term, in a motion picture and then it was in ruins. 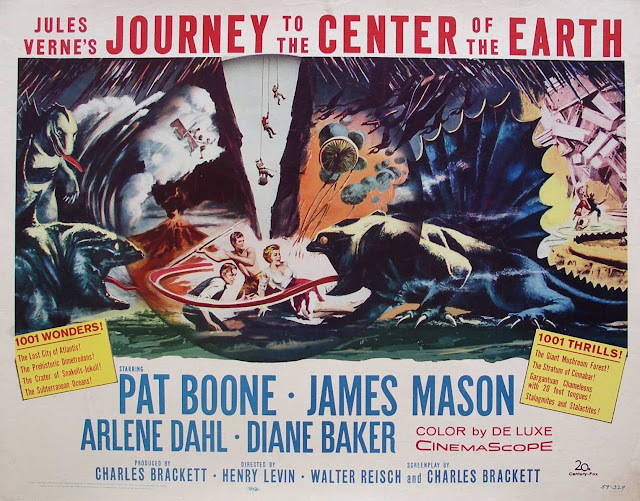 I was 13 years old on December 16, 1959 when the highly enjoyable "Journey to the Center of the Earth" was released. This version of Jules Verne's novel starred popular singer and sometimes actor Pat Boone, James Mason, Arlene Dahl and in her second motion picture Diane Baker. The story tells of finding a volcanic rock that contains a "Plumb Bob" on which, in blood, a famous Icelandic Explorer states he has found a way to the center of the Earth at a specific point on a volcano. The film then follows the adventures of "Professor Sir Oliver Lindenbrook", Mason, his student "Alec McEwan", Boone, the widow of "Lindenbrook's" competition "Carla Goteborg", Arlene Dahl, and their guide "Hans Bjerke", Peter Ronson, as they enter the volcano. 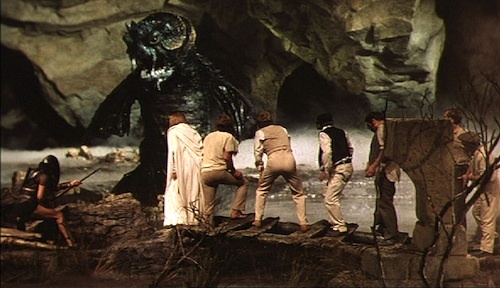 'Atlantis' appears at the climax of the motion picture when it is discovered by the three explorers in ruins and provides the means of escape from the Earth's center. The picture, at this time, holds an 86% on the website "Rotten Tomatoes". Sometimes a great idea is destroyed by a mediocre budget. 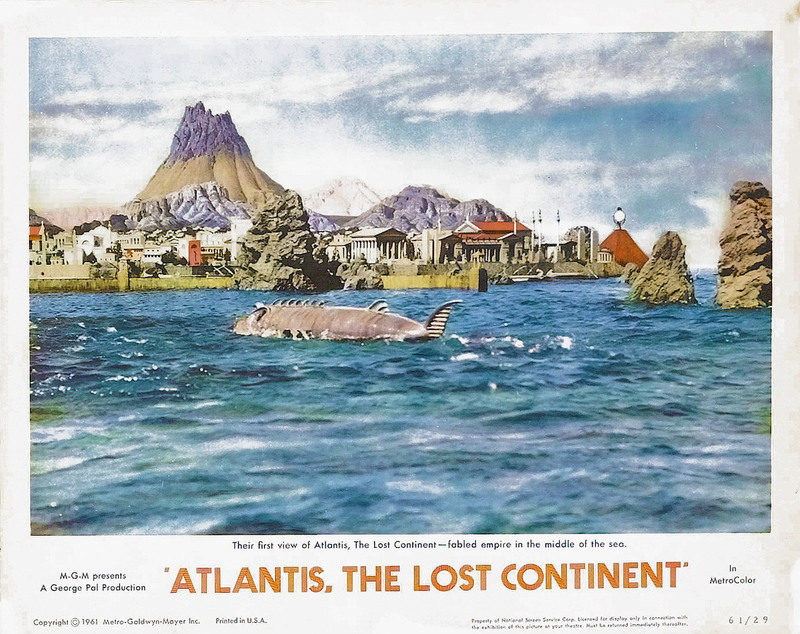 Producer and Director George Pal released "Atlantis the Lost Continent" on May 3, 1961. Pal was known for the creation of the "Puppetoons", 1951's "Destination Moon", 1953 Academy Award winning "War of the Worlds" and the 1958 musical "Tom Thumb". In this picture the concept was right, but the creature make-ups and special effects were almost as bad as the lead actor Anthony Hall. Who was in reality an Italian actor named Sal Ponti with a dubbed voice. Greek fisherman "Demetrios", Hall or Ponti, and his father are fishing when they spot ship wreckage. On some of it is a young girl who turns out to he "Princes Antillia" of "Atlantis". "Antillia" will convince "Demetrios" to take her to "the ends of the Earth" and her home of "Atlantis". He agrees to attempt to get there for a certain amount of days and if they do not find her home.They will return to Greece and she will become his wife. "Demetrios: thinks a sea serpent is attacking them, but it is a submarine from the advanced civilization of "Atlantis". I wish we saw more of the sub as it is the most interesting idea in the motion picture. The scientists of "Atlantis" experiment on turning people into animal creatures and one of them is a friend of "Demetrios". The fisherman is also to be experimented upon until "Antillia's" father orders him to the slave pits instead. Upon discovering what has happened to "Demetrois". 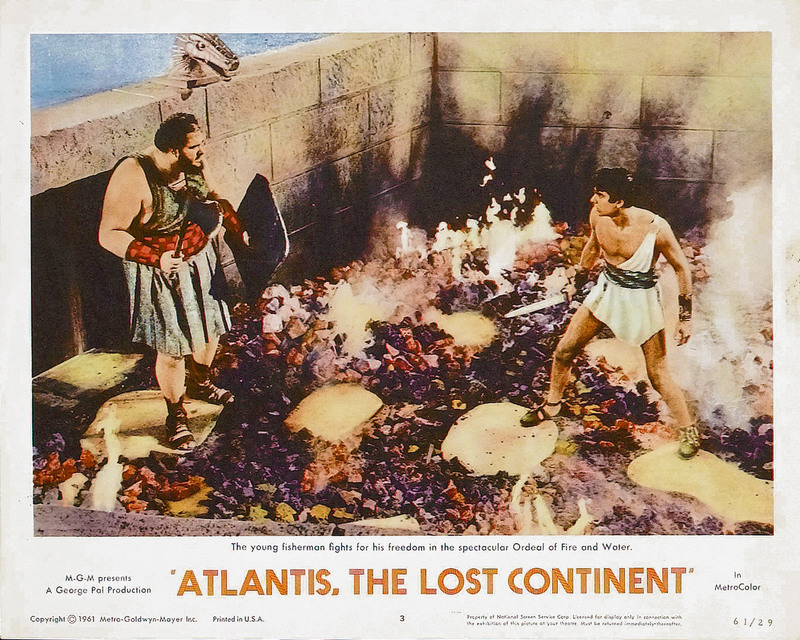 "Antillia" pleads his case to her father and the fisherman is given a chance to become a citizen of "Atlantis", if he is the victor in a gladiatorial style combat on a pit of hot coals. As a free citizen "Demetrios" plans a way to escape with "Antillia" and help the other slaves. Below he speaks to the Religious leader portrayed by Edward Platt. Better known as "The Chief" on television's "Get Smart". Platt tells Hall that the volcano is nearing eruption and that will destroy the continent. The statue in the following still contains one of the larger crystal's used by the Atlantean's as a power source. This idea goes back to Christian mystic and "Sleeping Prophet" American Edgar Cayce, 1877 to 1945. Among the many things Cayce "Saw" was "Atlantis" and claimed he was reincarnated as where others from the Atlantean's. They slaves slowly start to turn the system controlling the volcano at the center of the continent. So it will not be noticed. This is done over a period of days and will lead to the foretold eruption and end of the continent. On the left, below, is the evil counselor "Zaren" played by John Dall.. Who is seen with his henchman the "Captain of the Guard" portrayed by William Smith. Below "Zaren" is attempting to kill fleeing Atlantean's from the volcano's eruption by using the "Death Ray Crystal". The destruction of "Atlantis" used stock footage from George Pal's 1954 motion picture "The Naked Jungle" and very bad models. During the eruption the crystal moves and "Zaren" gets hit. Too bad he was the only really interesting character in the movie. I never could figure out why "Antillia", "Demetrios" and some of the others went to fishing boats instead of the submarine to escape. The picture starts and ends with an animated sequences. The opening explaining the legend of the Lost Continent. The ending about what may have happened to the people who survived its destruction. 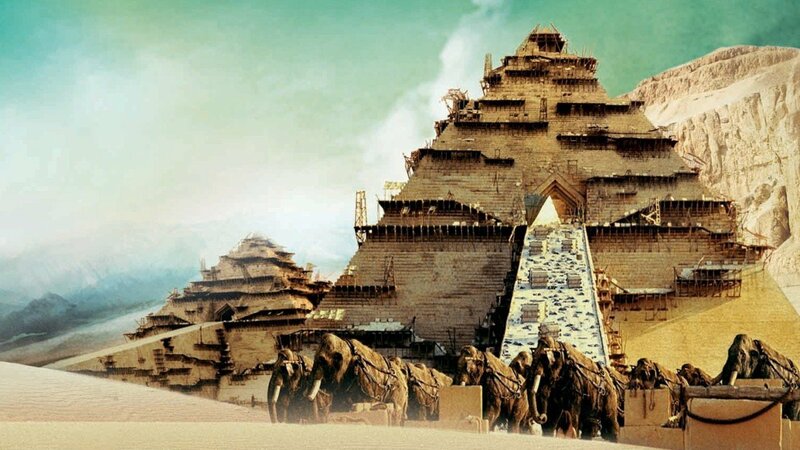 Going to the idea that there was a central source for Egyptian, the Aztec and Mayan civilizations building pyramids and having other similarities. On November 23, 1963 the British Broadcasting Corporation (BBC) premiered a new television series initially aimed at teaching children about historical events. One historical event actually occurred the day before the series premiered in the U.K.. Sadly this was the assassination of United States President John F. Kennedy. That event was never addressed as the series switched to Science Fiction. The original star of this BBC series was William Hartnell, but on October 29, 1966 he "renewed" himself. 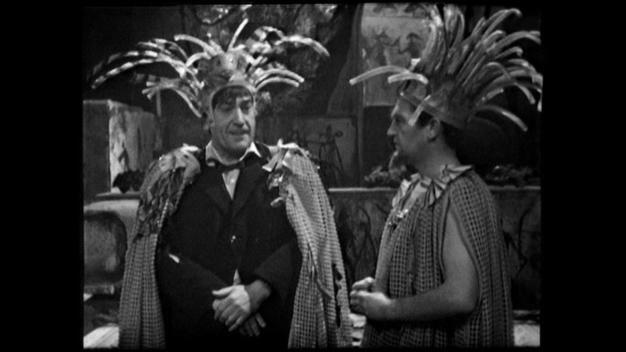 A term that became "regeneration" into the Second "Dr. Who" portrayed by Patrick Troughton and the "Second Doctor" was in the first of three programs dealing with "Atlantis". 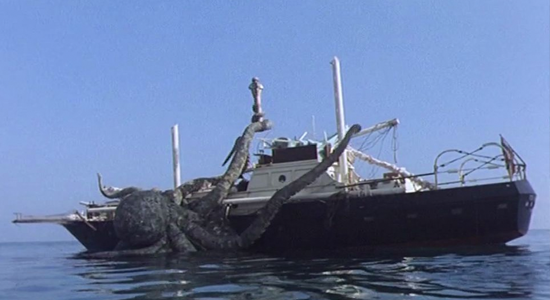 "The Underwater Meance" was a four part serial, only two remain, showing between January 14, 1967 and February 4, 1967. 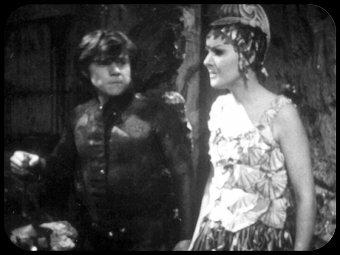 In it the "Doctor", Patrick Troughton, and his companions "Jamie McCrimmon", Frazer Hines, "Polly", Anneke Willis and "Ben Jackson", Michael Craze, find themselves captured on a deserted volcanic island by the survivors of "Atlantis". The story has the usual "Dr. Who" elements of a mad scientist from the surface "Professor. Zaroff", Joseph Furst. He has a plan to raise the lost continent back to the surface and conquer the Earth. Then there's "Damon", Colin Jeavons, a mad Atlantean scientist that wants to convert subjects to fish people. "Polly" about to be turned into a fish person. 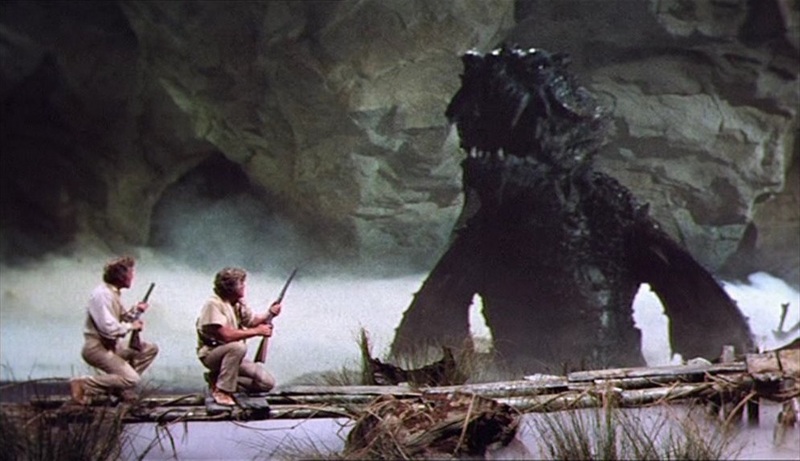 The only way to stop "Professor Zaroff" is to cause "Atlantis" to sink even farther into the ocean. So that's the "Professor's" machine for raising the continent will be completely covered in ocean water and be ineffective. The Atlantians are warned to get to a higher level and this saves most of the people from drowning. 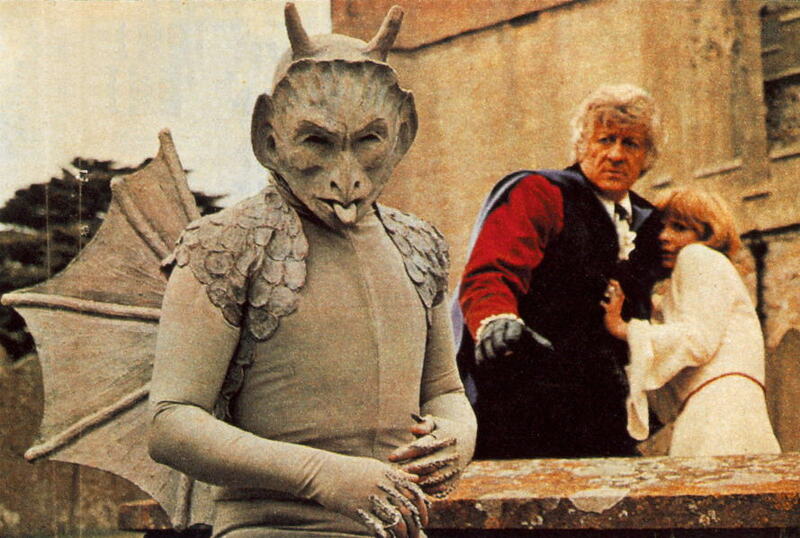 Moving forward to the Third "Doctor Who", portrayed by Jon Pertwee, are the other two adventures concerning Atlantis. 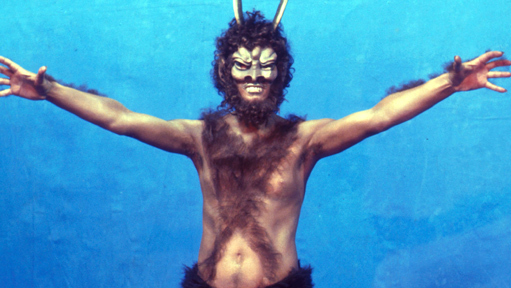 "The Daemons" ran for five episodes between May 22nd to June 19, 1971. For fans of the "Doctor" the show included his companion "Jo Grant", Katy Manning, "Brigadier Lethbridge-Stewart", Nicholas Courtney, "Captain Mike Yates", Richard Franklin and my favorite "Master", Roger Delgado. A little bit of "Quatermass and the Pitt" from another BBC program enters this story, or as the motion picture version is known in the United States "Five Million Years to Earth",. The "Doctor" and "Jo" enter the village of "Devil's End" were an archaeological dig will lead to bringing back the "Horned Devil". At the dig a small spaceship will be discovered. The lifting from the other show is very obvious here. 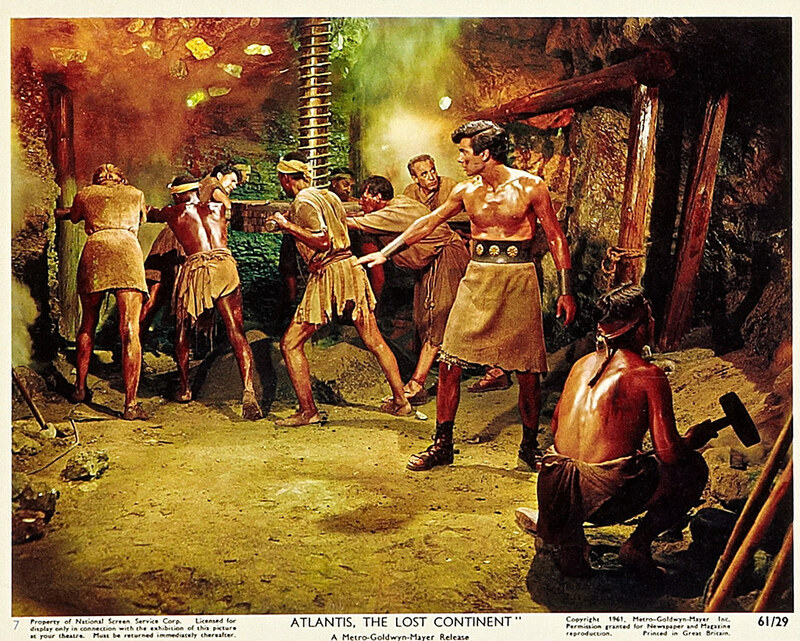 The story's connection to "Atlantis" is just a passing mention connected to the Godlike "Azal", Stephen Thorne, Once again Barry Lefts and Robert Sloman's screenplay, both men being credited on screen as just writer Guy Leopold, lifts from the 1958 earlier program's story line. As the spaceship reveals the "Azal" is actually an alien who was known also to the Atlantians. The story ends in a confrontation in a church, but script editor Terrence Dicks had concerns that some of the story implied the villages were "Satanists". This was toned down. 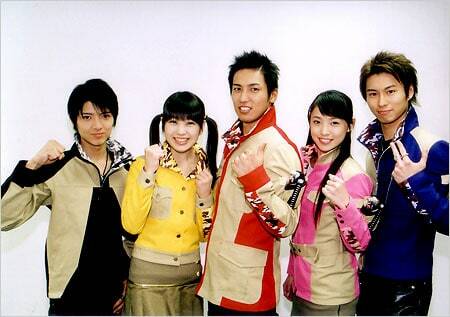 For "The Time Monster" the same four leading characters and actors returned. The six episodes were seen between May 20th to June 24, 1972. In this program "The Master" transports the Atlanean "High Priest of Kronos named Krasis"", Marc Boyle, to his 20th Century home. 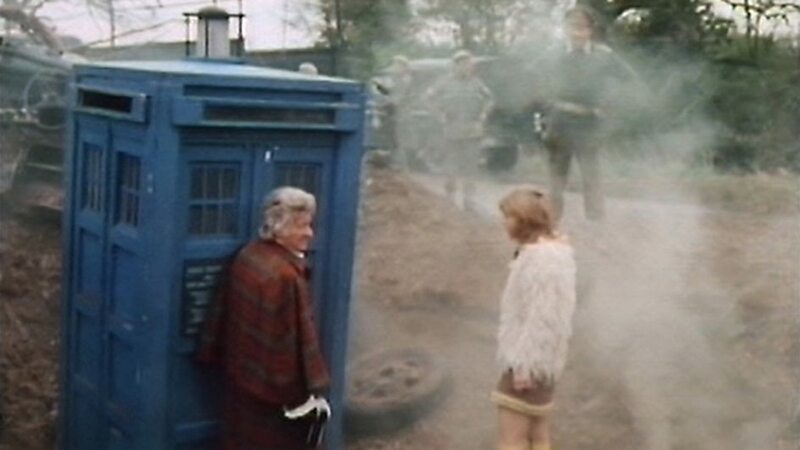 According to the "Third Doctor" "Kronos" is a "Chronovore". A creature living out of time, but feeding on time itself. The battle with his fellow "Time Lord".will mean taking the "TARDIS" back in time to "Atlantis" to battle both the "Master' and "Kronos"..
On May 5, 1978 the U.K. also had the next big screen entry with "Warlords of Atlantis" starring American actor Doug McClure. Previously McClure had been seen in three British productions based upon American author Edgar Rice Burroughs novels. These were 1974's "The Land That Time Forgot", 1976's "At the Earth's Core" and 1977's "The People That Time Forgot". With this picture all four were directed by Kevin Connor who knew were to put his tongue in cheek. 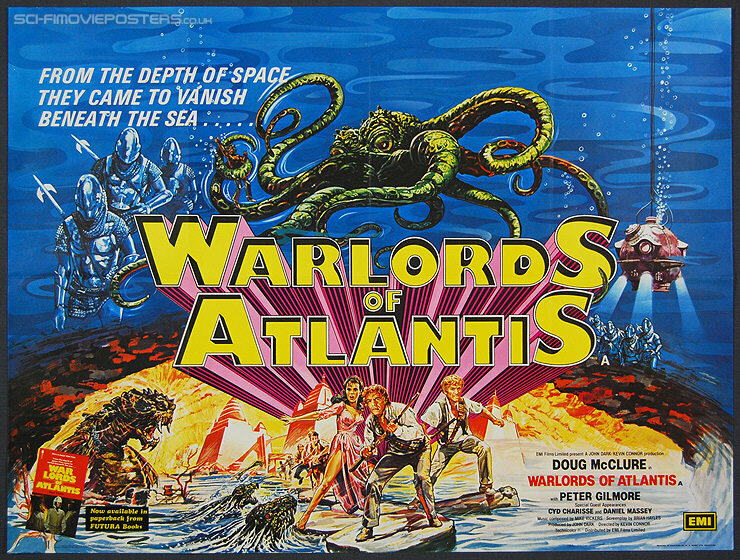 When it was originally released I saw the picture under the title "Warlords of Atlantis", but later it was changed to "Warlords of the Deep". 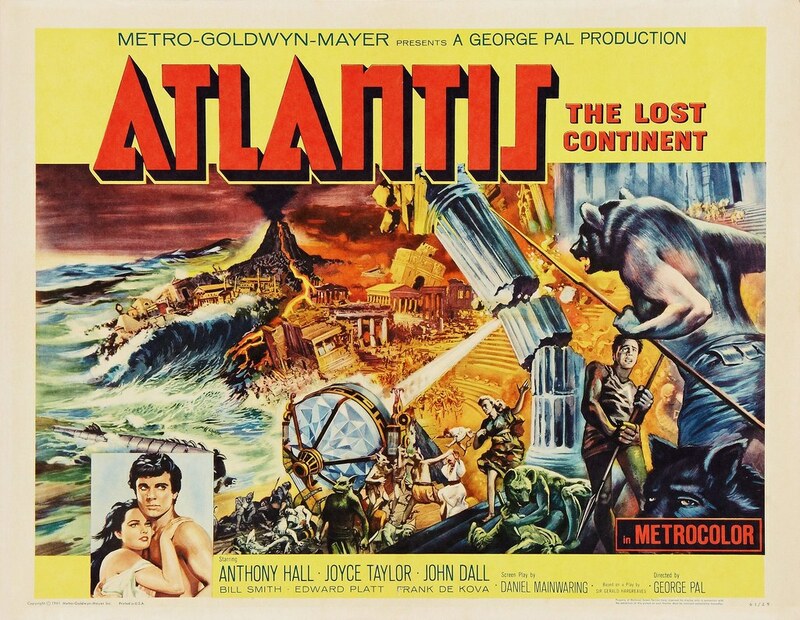 This adventure story, as the above poster indicates, has the Atlantean's actually an alien race. Thereby explaining their superior intelligence and progress related by Plato and other writers. The plot, set at the start of the 20th Century, has "Professor Aiken", Donald Bisset, and his son "Charles", Peter Gilmore, apparently wanting to go out into the Atlantic Ocean to look for undiscovered species of fish. The two British Archaeologists commission the American ship the "Texas Rose" to take them into the Atlantic and plan, so they say, to use a diving bell designed by American "Gregg Collinson", McClure. to locate these new fish species. In actuality the two are looking for the lost city of Atlantis. First plot problem is why would British Archaeologists be looking for new species of fish? That should be the work of Ichthyologists. 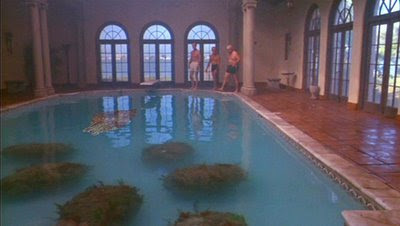 "Gregg" and "Charles" make an initial dive and discover "Atlantis", but are attacked by a sea monster. "Gregg" saves the day by sending an electrical shock into it. The two explorers find a solid gold statue and attach a line so it may be raised to the surface. After raising the status it is placed upon the deck of the "Texas Rose". Almost immediately some of the crew decide they want it and attempt a minor mutiny and during the scuffle the "Professor" is injured. 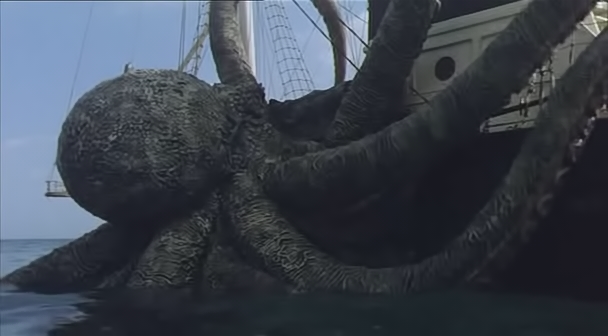 While this is occurring a giant octopus controlled by the people of "Atlantis" breaks the surface, attacks the ship, takes four of the mutineers and then retreats back under water capturing the diving bell. Which was cut free of all its lines previously by the mutinying crew members. 2nd screenplay problem, but don't ask how the crew members, not in the diving bell, are able to breathe under water until they arrive at the lost continent. What makes this movie really interesting to movie buffs are the actors playing the three Atlantean leaders. "Atsil", Atraxon" and "Atmir". 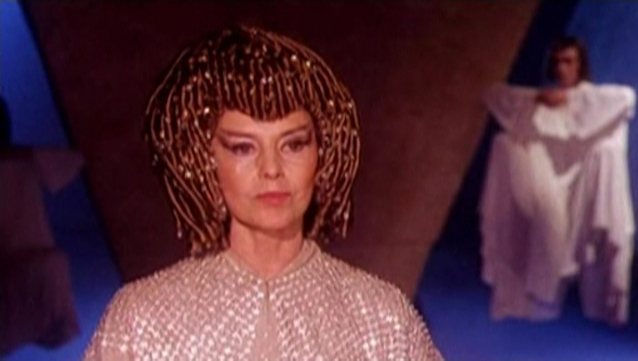 The role of "Atsil" was portrayed by dancer and actress Cyd Charisse. Probably best known for dancing opposite Fred Astaire in "1953's "The Band Wagon" and 1957's "Silk Stockings". Along with opposite Gene Kelly in 1952's "Singing in the Rain" and 1954's "Brigadoon". The role of "Atraxon" was portrayed by actor Daniel Massey, Raymond Massey's son. and the the godson of Noel Coward. Whom he played in the Julie Andrews motion picture musical "STAR". The role of "Atmir" was portrayed by Michael Gothard. Gothard is best known to American audiences for the role of "Emile Leopold Locque" in the 1981 "James Bond" thriller "For Your Eyes Only". to become a "Spiritual Healer" in 2000. Below "Delphine" with her father "Captain Briggs" portrayed by Robert Brown. Brown was in "The Spy Who Loved Me". and then portrayed "M" in the next four "James Bond" films. What makes "Captain Briggs" being in "Atlantis" more interesting is that he was the "Captain of the Mary Celeste". The real "Mary Celeste" was discovered adrift on the ocean without crew on December 5, 1872. So that fact raises the question how old is "Briggs" and "Delphine" and what happens if they ever leave Atlantis? In the end there is a slave revolt led by "Captain Briggs". "Greg", "Charles" and the other crew members of the "Texas Rose" escape to the surface in the diving bell. Again bringing up the last screenplay problem. How does a diving bell not attached to any lines actually raise up to the surface of the Atlantic Ocean? Who cares as we enjoy the ride. 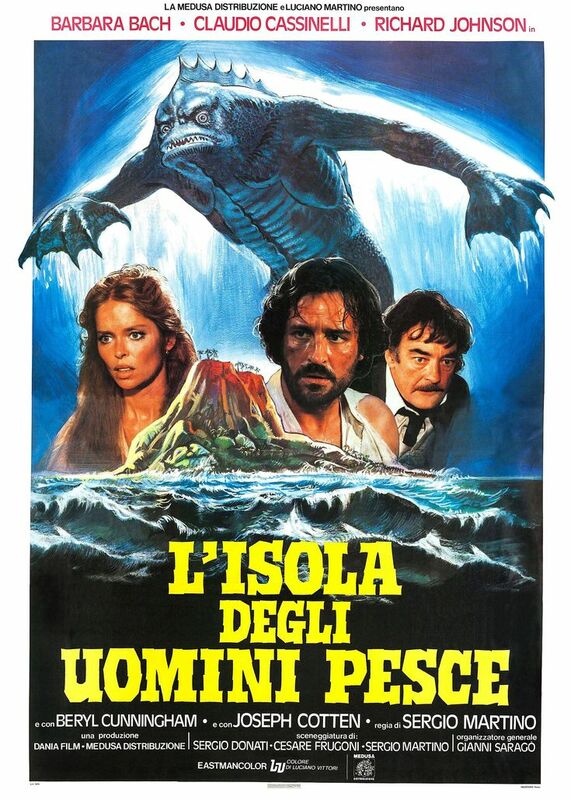 On January 19, 1979 Italian producer Luciano Martino and director Sergio Martino brought their audience "L'isola degi uomini pescse (Island of the Fishmen)". 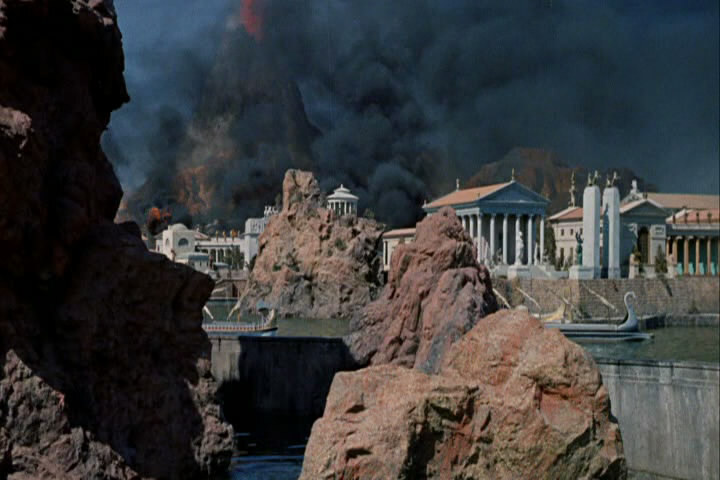 The film revolves around the ruins of "Atlantis" and in a tale of horror, but as my reader will learn. When the picture came to the United States several changes and additions were made to it. The original Italian language movie stars American actress and model Barbara Bach as "Amanda Marvin". Bach who appeared in many Italian motion pictures is best known for her role in the 1977 "James Bond" movie "The Spy Who Loved Me" and being married to Beatles drummer "Ringo Star". Below Bach with two of her co-stars. Followed by Bach and Claudio Cassinelli. Portraying the sadistic "Edmond Rackham" was British actor Richard Johnson. 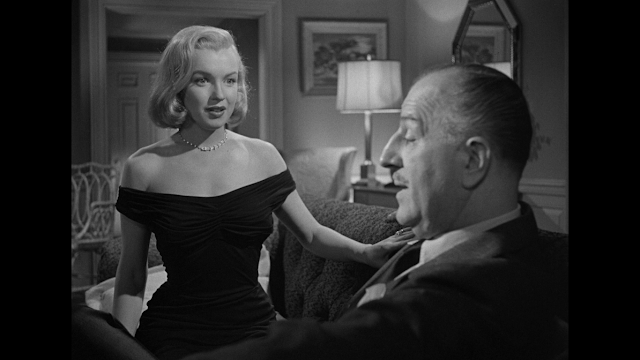 In 1951 the actor was in the British and United States motion picture version of C.S. Forester's classic character "Captain Horatio Hornblower" starring Gregory Peck. In 1963 Johnson had the lead in director Robert Wise's "The Haunting" based upon Shirley Jackson's frightening novel "The Haunting of Hill House" and in 1966 he co-starred with Charlton Heston and Lawrence Olivier in "Khartoum". The original Italian plot takes place in 1891. When "Lieutenant de Ross" is shipwrecked escorting several convicts. They make it to an uncharted Caribbean island, but some of the convicts are killed by the "Fishmen". The Lieutenant and the remaining convicts head in land into the jungle. 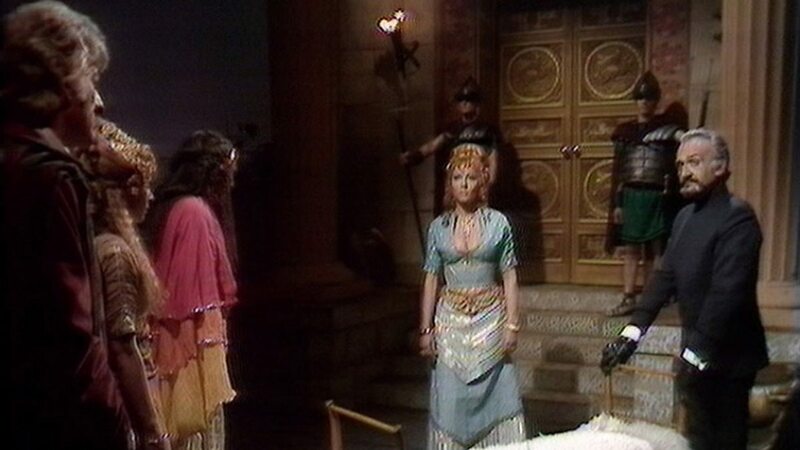 There they encounter "Rackham" and his prisoner "Amanda". "Rackman" has been forcing "Professor Ernest Marvin", Joseph Cotton, to perform surgeries on people turning them into the "Fishmen". 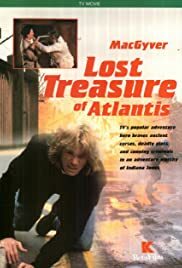 "Rackman" had discovered the lost city of "Atlantis" and is using "Marvin's" creations to plunder the city of its treasures and scientific secrets. The original Italian version is very good, but than New World Productions, at the time still owned by Roger Corman, got into the act for the English language version. They initially changed the name to "Something Waits in the Dark". A new English language screenplay was written, musical cues were added at certain horror points and a prologue was also shot. 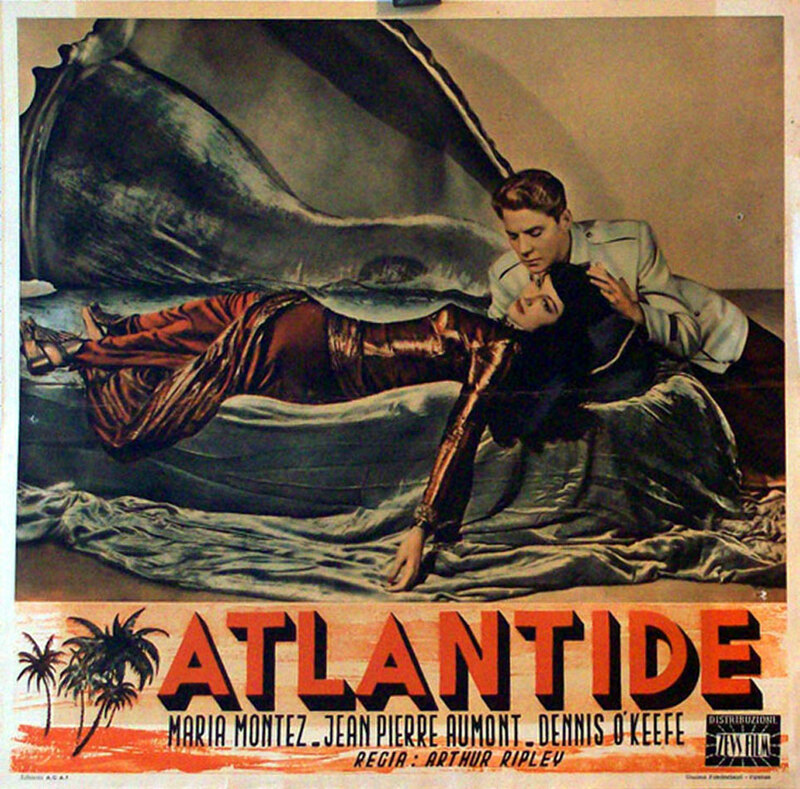 That prologue featured American actor Cameron Mitchell as a sea captain hired by a "gentlemen" portrayed by Mel Ferrer who is searching for "Atlantis". It was released in 1980 and at the bottom of the poster both actors from the prologue are listed. This version of the movie didn't do well and it was decided to rework the English language version. It was also re titled in 1981 as "Screamers" and should not to be confused with the 1995 Canadian film of the same name. They're men turned inside out! A sequence was shot just for the new trailer of an alive man actually being turned inside out. However, complaints came in about the scene not being in the picture. So once again the English language version was pulled, that scene inserted, and the English language cut of the Italian picture released for the third time. Then there is apparently an actual English language dub of the original Italian motion picture. Take your pick. Oh, and to add to the confusion. The English dub is also known as "Islands of Mutations". The idea of "Atlantis" being populated by Outer Space Aliens was used once more as background for the 1985 Ron Howard motion picture "Cocoon". Which was based upon the novel by David Saperstein . 10,000 years prior to this story. 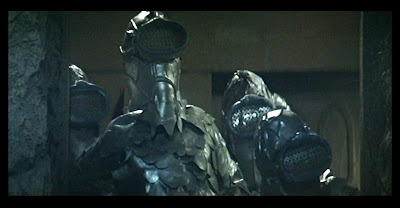 Aliens from the planet Antarea arrive on Earth and set up an outpost on what becomes "Atlantis". When the destruction of the outpost occurs. The aliens leave Earth, but 20 of their race have to be left behind in rock cocoons. This opening is the only reference to "Atlantis" used. Switch to a 1985 Retirement Home next to a house owned by some of the Aliens. The Antarean's are disguised to look like humans. They are here to get those left behind and return them to Antarea. To strengthen those in the cocoons for the space trip. The water in an indoor swimming pool is energized with a life force. The fun begins when some of those from the retirement home sneak into the house to take a swim in the pool and become younger. Between 1988 and 1995 there were three more entries concerning Atlantis. Released February 26, 1988 was "Alien From L.A.". Nerdy "Wanda Saknussemm", Kathy Ireland, is even an outcast within Los Angeles. She wears large glasses and has a squeaky voice. She receives news that her father, an archaeologist, has died in North Africa. She goes there to take care of her father's burial and looking through his possessions discovers notes that speak of the a way into the lost city of "Atlantis". A name needs to be mentioned here, Jules Verne, and his novel "Journey to the Center of the Earth". In the novel, as in the 1959 previously mentioned motion picture, the directions to enter the earth comes from a dead explorer named "Arne Saknussemm". In the film "Wanda's" father is "Arnold Saknussemm". The change here is that "Atlantis" still exists under the surface and "Wanda" finds true love. 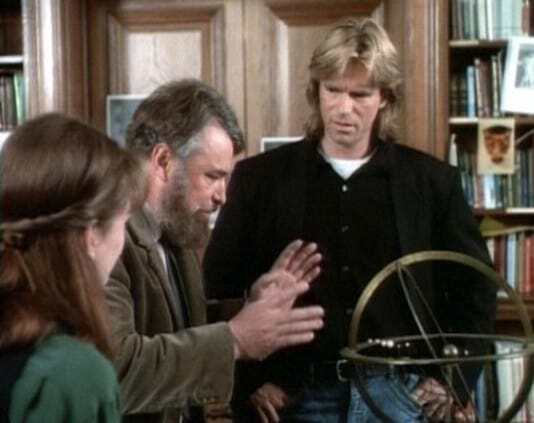 There was a made for TV movie shown May 14, 1994 starring Richard Dean Anderson as "Angus MacGyver". In which "Mac" and a College Professor search for the Lost Continent. On March 11, 1995 the Japanese studio Daiei Film recreated their star kaiju "Gamera". 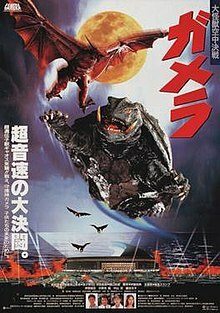 The original Japanese title of the picture was "Gamera: Daikaiju Kuchu Kessen (Gamera: Giant Monster Mid-air Battle)" known in English speaking countries as "Gamera: Guardian of the Universe". The first motion picture in a trilogy. 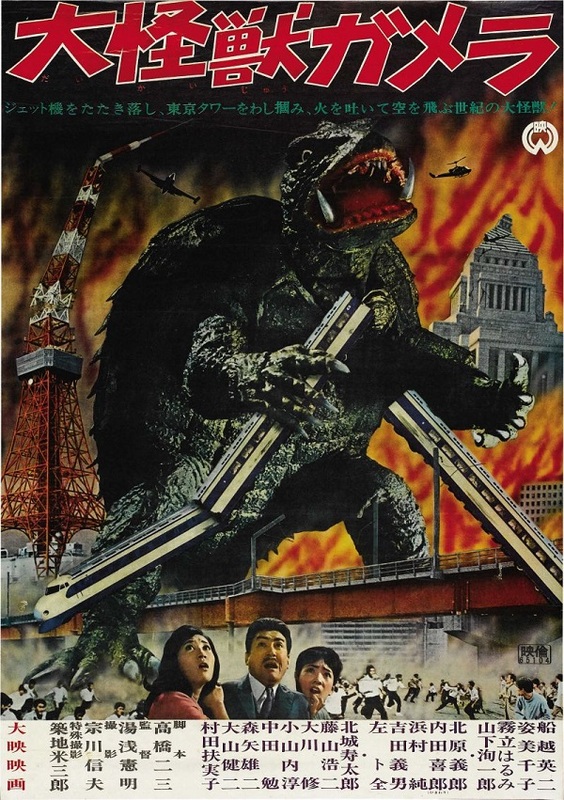 Originally on November 27, 1965 the film "Daikaiju Gamera (Giant Monster Gamera)" premiered in Japan. "Gamera"was presented as a prehistoric turtle that breathes fire, fly's and protects children. This concept lasted through all eight Showa Era motion pictures. When the Hesei Era Trilogy came out there were two changes. The first was "Gamera" now has a mental link to the human child. 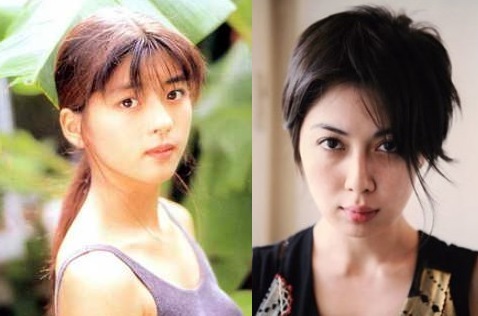 In the case of the trilogy her name is "Asagi Kusanagi" portrayed by Ayako Fujitani. Ayako's father is American martial arts actor Steven Seagal and her mother is akido martial arts master Miyako Fujitani. 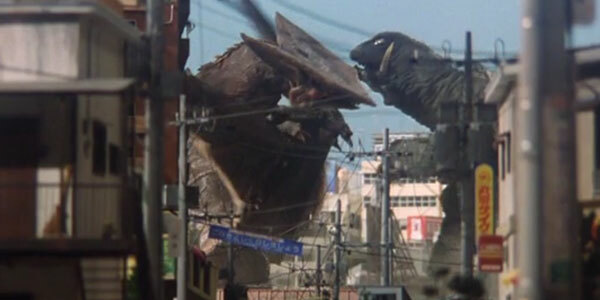 In the trilogy "Gamera" and it's opponent "Gyaos" are bio-engineered and created by the people of "Atlantis". Both are no longer prehistoric animals. 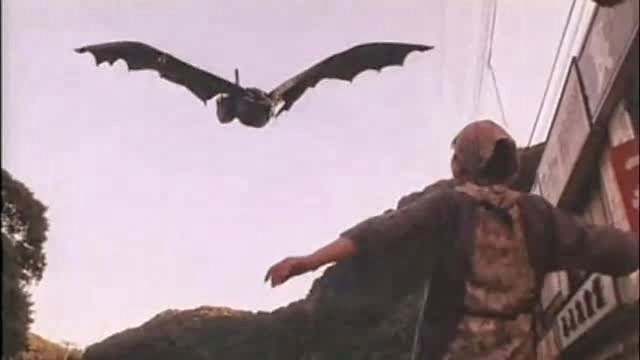 Apparently "Gyaos" was originally created, but something went wrong and it became a flesh eating bird that can reproduce. 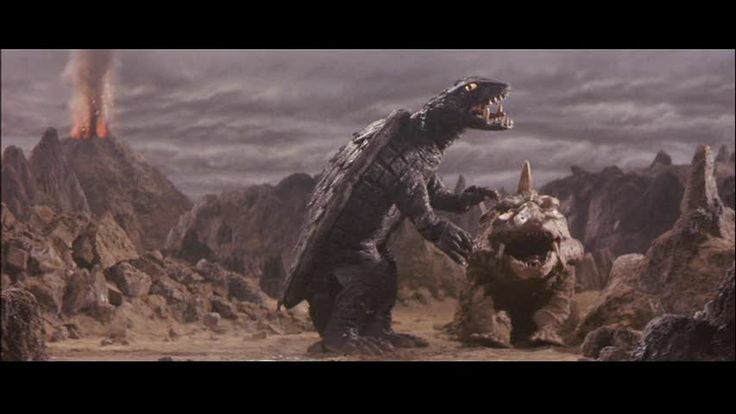 "Gamera" was created to fight "Gyaos" and defend the Earth. In the third motion picture of the trilogy "Gamera Suri Jyashin Irisu Kakusei (Gamera 3: Evil <Iris> Awakening)" aka: "Gamera 3: The Revenge of Iris". A graveyard of "Gamera" skeletons is discovered indicating the current "Gamera" was not the only one of its bio-engineered species. In fact one character refer to the skeletons as "Beta Versions". Possibly implying these were mistakes made by the Atlantean's when creating "Gamera". It should be noted that in the first of the two 2014 Blu-ray releases of the complete original Showa Era "Gamera". That the new subtitles for the first film "Gamera the Giant Monster" now states he came from "Atlantis". While the original film release never mentioned that he was anything other than a form of prehistoric turtle. On June 3, 2001 the Walt Disney Company released an animated picture "Atlantis: The Lost Empire". This family film opens with a tidal wave destroying "Atlantis" and then centuries later in 1914 our hero "Milo Thatch", voiced by Michael J. Fox, joins an expedition to find it. His profession is that of cartographer and linguist. The story follows the group of adventures, the discovery of a populated "Atlantis" and "Milo" falling in love with the Atlantean "Princess Kidagakash 'Kida' Nedakh" voiced by Cree Summer. What is interesting as with George Pal's production. The screenplay by Tab Murphy and David Reynolds also uses Edgar Cayce's "Atlantis" writings and brings out a civilization that requires the use of crystals for power and looks Egyptian. On May 20, 2003 the Walt Disney Company released a straight to DVD sequel entitled "Atlantis: Milo's Return" aka: "Atlantis II: Milo's Return". Cree Summer was back as the voice of the now Atlantean Queen and replacing Michael J. Fox was James Arnold Taylor as the voice of "King Milo James Thatch". Otherwise this was a formula family animated picture with some of the original characters and a few new ones and a lesser quality of animation. The series opens with a love triangle between a women "Haring Agnat" and two men "Reyna Celebes" and "Barracud". This triangle causes the undersea kingdom to split into good and dark sides. 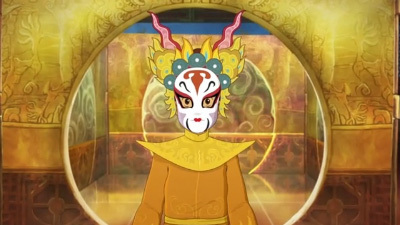 Move forward and "Aquario" a "Senturon" must face his destiny of saving "Atlantika" by finding the two lost Princesses. However, there are four possibilities, see the above picture, but only one of the two is destined for him and the another will destroy "Atlantika". Can he find the two and then discover which is which? The last film, to the date of this article, mentioning "Atlantis" was released on March 7, 2008 entitled "10,000 B.C.". The picture was a joint production of Legendary Pictures and Centropolis Productions. It was produced and directed by Roland Emmerich. This story follows a tribe of hunters and specifically one mammoth hunter named "D'Leh". He becomes a slave of a group from an advanced civilization believed to have sunk into the ocean. There is a map showing a land mass in the center of what would be the Atlantic Ocean. A slight problem is that the mountain range where "D'Leh's" tribe lives is the Urals. Which are located in Russia near the Arctic Ocean above the Pacific. Perhaps the screenplay she have referred to "Lemuria". The first time anyone mentions the "Lost Continent of Lemuria" will be found in the writings of Russian Occultist Helena Blavatsky 1831 to 1891. 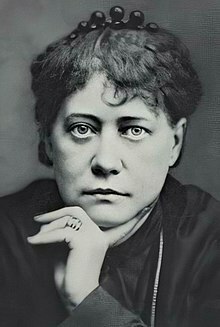 Helen Blavatsky, who co-founded the "Theosophical Society" in the United States, based her theories partly on a Tibetan book called the "Book of Dzyan". 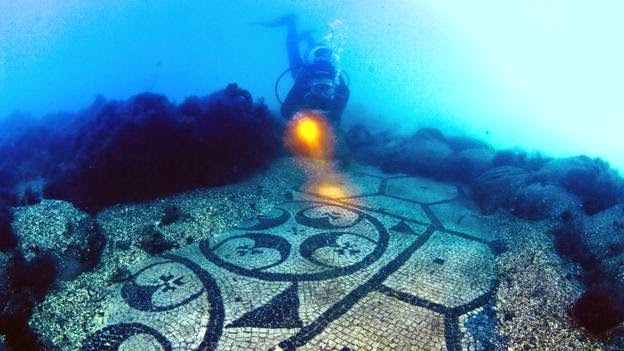 Which she claimed predated "Atlantis". Blavatsky's main theory was that there were "Seven Root Races", or stages, in the evolution of man and the third was on "Lemuria". In 1896 English theosophical author William Scott-Elliot published his work "The Story of Atlantis" and in 1904 followed it with "Lost Lemurira". Scott-Elliot claimed he received his knowledge of the two continents from Charles Webster-Leadbeater. Leadbeater, like Edgar Cayce, claimed to be in contact with the ancient "Theosophical Masters" through "astral clairvoyance", These "Masters" helped William Scott-Elliot make the first map of "Lemuria". According to Scott-Elliot;s 1896 map. The Continent of "Lemuria" was located from the east coast of Africa, across the Indian Ocean and into the Pacific Ocean. In 1894 Frederick Spencer Oliver wrote his work "A Dweller on Two Planets". It was not published until after his death by Oliver's mother in 1905. According to the author the book was "Channeled" through him by the "Automatic Writing" and "Visions" of one "Phylos the Thibetan". According to "Phylos" the survivors of "Lemuria" were living on the volcano Mount Shasta. Which is located in Siskiyou County, Northern California. In 1931 Harvey Spencer Lewis a noted "Rosicrucian", a spiritual and cultural society founded in 17th Century Europe, used the pseudonym of "Wiser Spenie Cervel". He then wrote about the "Lemurians" living on Mount Shasta. Supposedly there was a hidden city on the volcano that was occupied by the survivors of "Lemuria". Below Harvey Spencer Lewis at the time he wrote his work. 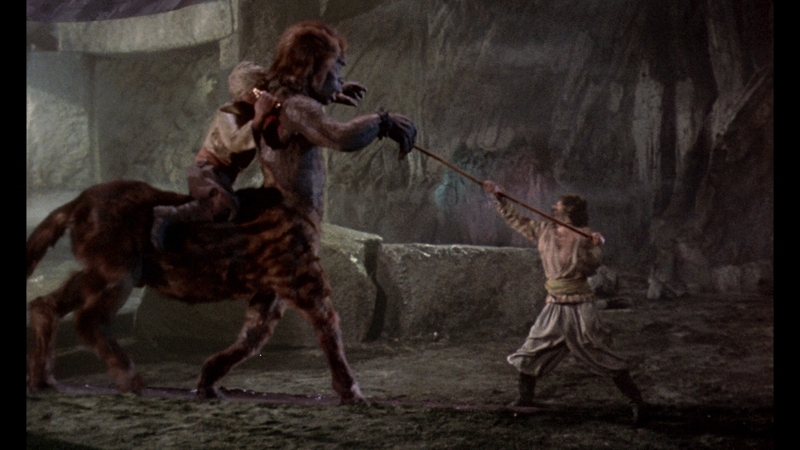 The first motion picture to use "Lemuria" in its plot came three years after Lewis' book. 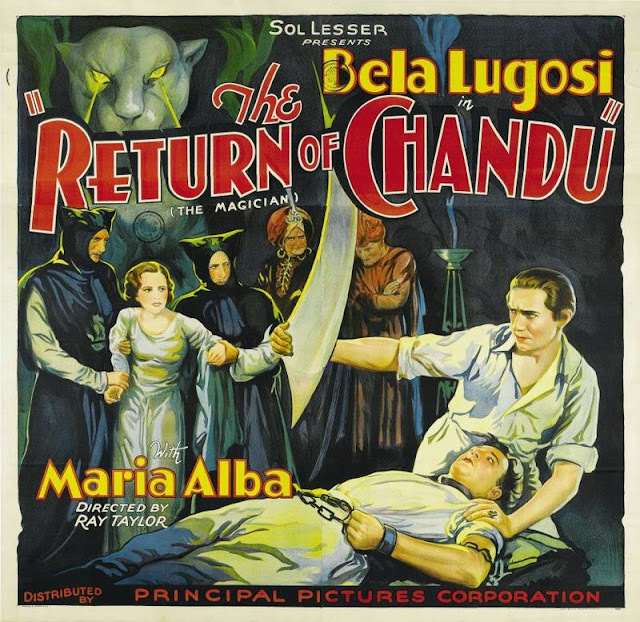 Released October 1, 1934, the 12 part Chapter Serial "The Return of Chandu" starred Bela Lugosi. in a very rare heroic role. 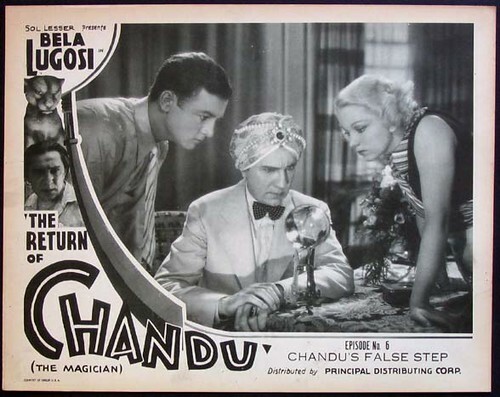 Lugosi portrayed "Frank Chandler" who is really "Chandu the Magician". Think Marvel's "Dr. Strange". A cult of Sorcerers who practice "Black Magic" and are known as the "Sect of Ubasti" have recovered the body of their last "High Priestess Ossana". The cult is following the legend that says "Ossana" will someday return and rule over the lost continent of "Lemuria". Will "Chnadu" stop the rebirth of "Ossana" and the reemergence of the "Lost Continent of Lemuria"? Actress Maria Alba portrays "Princes Nadji" the only "Living Egyptian Princess". "Nadji" is to be sacrificed by the "Sect of Ubasti" to bring their High Priestess to life. Think 1932's "The Mummy" starring Boris Karloff and Zita Johann. On March 6, 1935 another 12 Chapter Serial came out entitled "The Lost City". I direct you to the popular star, of the silent and early sound eras, that played the villain and was the lead. His name, as shown on this poster, was William "Stage" Boyd. The "Stage" actor turned motion picture actor had to adopt the middle "Nickname" not to be confused with actor William Boyd. Who portrayed "Hopalong Cassidy" in a series of very successful "B" Westerns. 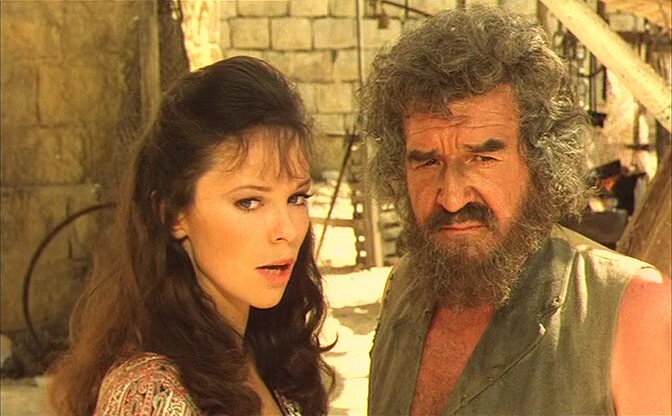 Below William "Stage" Boyd as "Zolok" in "The Lost City". Below William Boyd as "Hopalong Cassidy" the same year. 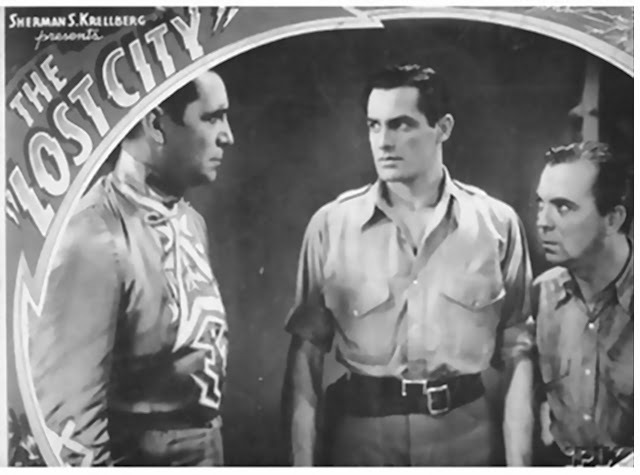 The characters of "The Lost City" included the hero "Bruce Gordon" portrayed by Kane Richmond. He is seen in the center of the following still with William "Stage" Boyd to his left. Richmond would go on to play the World War 2 hero "Spy Smasher" in a 1942 Chapter Serial.Two years later he was "Lamont Cranston" aka: "The Shadow" in three films he made about the character. Hayes is on the left of this still portraying "Butterfield". The plot of "The Lost City' concerns a series of electrically created disasters seemingly coming from an area within Africa. Scientist "Bruce Gordon" goes in search of the source and discovers the city of the title and the evil "Zolok". "Zolok" is the last of the "Lemurians" and he is attempting to create giant mindless slaves in order to take over the world. We have to move forward 38 years for the return of "Lemuria" to the motion picture screen and then the continent is mentioned twice. 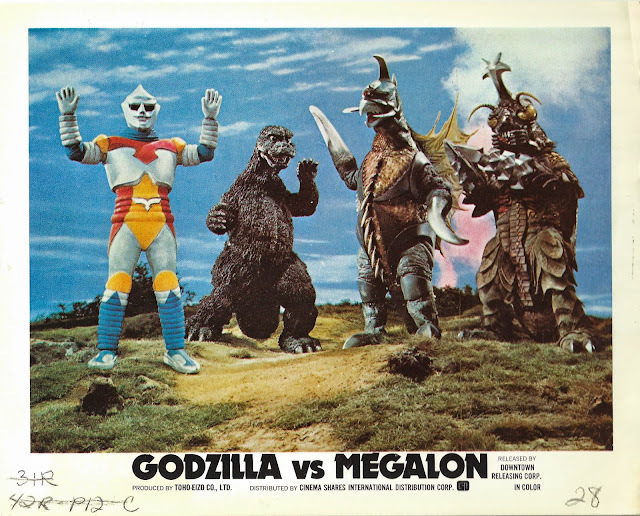 The first film was from Toho Studio's entitled "Gojira tai Megaro (Godzilla vs Megalon)" on March 17, 1973. The "Seatopians" the survivors of the sinking of "Lemuria". Have endured the Atomic Bomb tests of the surface dwellers for decades. They now decide to attack them and end the destructive testing. The "Seatopians" will release their beetle like"Megalon" against the upper world and it will be up to "Godzilla" to save the day. 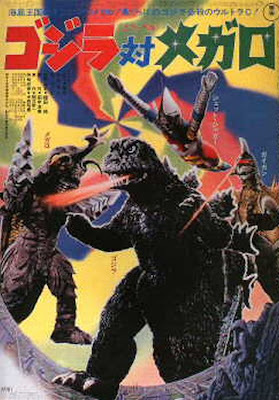 He will be assisted by a robot called "Jet Jaguar".However, before the final battle the "Seatopians" send a message to "Space Hunter Nebular M" for assistance and they send "Gigan". 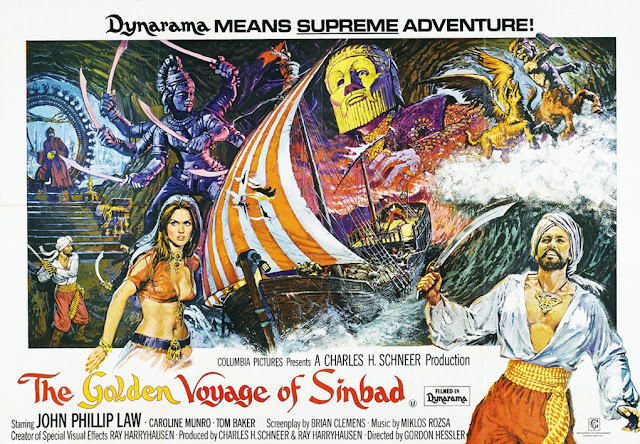 Opening on December 20, 1973 in London, England, was the second feature filled with the stop motion work of Ray Harryhausen and starred John Phillip Law in "The Golden Voyage of Sinbad". John Philip Law, by this time, had appeared in the Spaghetti Western" Death Rides A Horse" co-starring Lee Van Cleef, he was "Pygar" in Roger Vadim's "Barbarella" starring Jane Fonda and co-starred in Rodger Corman's "Von Richthofen and Brown" as the "Red Baron". 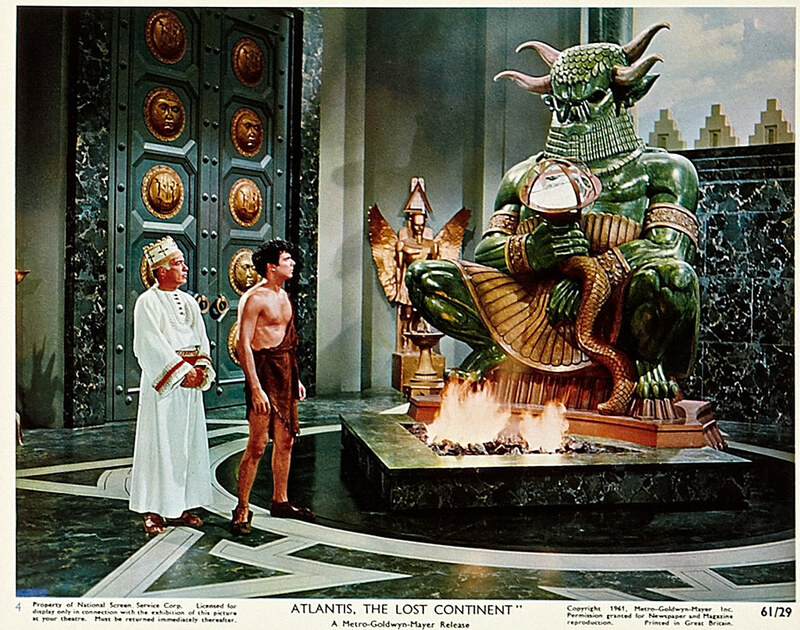 "The Golden Voyage of Sinbad" is the quest to find the "Fountain of Destiny" located on the "Lost Continent of Lemuria". 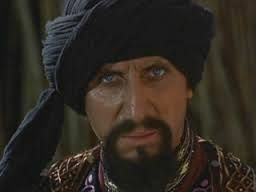 Opposing "Sinbad" is Tom Baker, "Rasputin" in the epic 1971 film "Nicholas and Alexandra" and the year following this film the "Fourth Dr. Who". 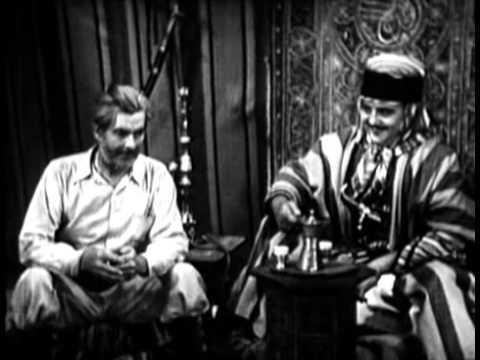 Above Law as "Sinbad" and below Baker as "Prince Koura". Portraying the women "Sinbad" has been dreaming about, "Marigana", was Caroline Munro. By this time she had appeared in both "Dr. Phibes" films as "Victoria Regina Phibes", "Dracula A.D. 1972", and would follow this picture with a favorite of mine, "Captain Kronos Vampire Killer" and the Edgar Rice Burrough's Science Fiction story "At the Earth's Core". There are no other motion pictures about "Lemuria", but there are references to the Lost Continent in movies and television. For example the Indian film "Sivaji" in 2007 had a passing reference and in 2014's Marvel and Disney's "Captain America: The Winter Soldier". Did you notice that the ship they rescue the hostages from at the film's start is named "The Lemurian Star"? Back between September 12, 1993 and December 2, 1994 was a cartoon series called "Mighty Max". This was a British cartoon to promote a line of "Mighty Max Toys". Can you think Hasbro in the United States? In this series the characters of "Virgil" and "Skullmaster" are "Lemurians". A "Lemurian" shows up in "The Secret Saturdays", 2008 into 2010, as "Fiskerton". "Lemuria" was the name of one of the Starship's in "Transformers: Cybertron" aka: "Transformers: Galaxy Force" from January to December 2005. It was also mentioned in the original opening narration to the original pilot of "Battlestar Galactica" in 1978. My last look at "Lemuria" moves back to Japanese television and the 30th "Super Sentai" series entry "GoGo Sentai Boukenger" shown between February 19, 2006 and February 11, 2007. 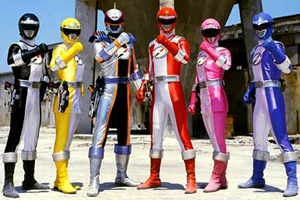 Footage from this entry was shown on American television as "Power Rangers Operation Overdrive". While the original series was dubbed into Korean for "Power Rangers Treasure Force". 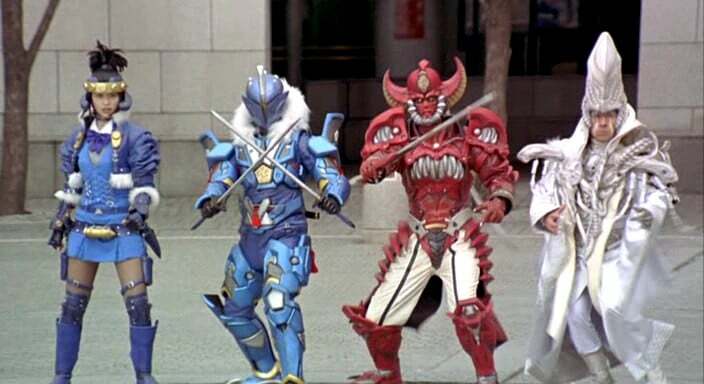 Below is a picture of the "Boukenger's" in a publicity still. The yellow ranger is named "Natsuki Mamiya" and she does not known much about her past. It will be discovered that "Natsuki" is actually the last survivor of "Lemuria". The basic plot has the good "Search Guard Successor Foundation" fighting the "Negative Syndicates" for possession of the "Precious". Which are ancient relics appearing around the World. Below members of the 'Negative Syndicates". I began this blog article by mentioning that "Mu" was located in a either in the Atlantic, or Pacific Oceans depending upon whose work my reader uses. Now for the explanation about this seemingly mobile Lost Continent. The idea of "Mu" began with explorer Augustus Le Plongeon, 1826 to 1908, a French-American photographer and amateur archaeologist. Le Plongeon specialized in pre-Columbian civilizations and concentrated on the Mayan's of the Yucatan peninsula. In 1873 Augustus Le Plongeon went to the Yucatan peninsula to prove his theory that the Mayan's were connected to both the Egyptians and the "Lost Continent of Atlantis". He claimed his beliefs were found in Mayan writings and that their civilization was actually older than either the Egyptian, or Greek. Le Plongeon stated the Mayan's traveled to another landmass that became known, from Plato, as "Atlantis" and then moved to the Mediterranean to start, among others, the Egyptian and Greek civilizations. In short Augustus Le Plongeon was considering "Lemuria" and "Atlantis" as one and the same placing it in the Atlantic Ocean. His mistake on the name came from another's mistake. Charles Etienne Brasseur de Bourbourg, 1814 to 1874, was a noted French writer, ethnographer (the study of people and cultures), historian and archaeologist. De Bourbourg mistranslated what was in 1864 called the 'Troano Codex". This work is now known as either "The Madrid Codex", or Tro-Cortesianus Codex". It is one of three remaining pre-Columbian Mayan books. In his writings and translation there was a Mayan word he believed was "Mu". It was not, but this led the archaeologist to state that "Mu" was a large continental land mass in the Atlantic Ocean and Le Plogeon picked it up as such. "Atlantis" was now "Mu", or until James Churchward came into the picture. Churchward, 1851 to 1936, moved "Mu" to the Pacific Ocean in a series of writings about the "Lost Continent". According to James Churhward "Mu" covered an area from somewhat north of what became the Hawaiian Islands to the south around both Fiji and Easter Island. Of course those primitive statues on Easter Island were erected by the people of his "Lost Continent". The following is a map Churchward made of the continent and its location. 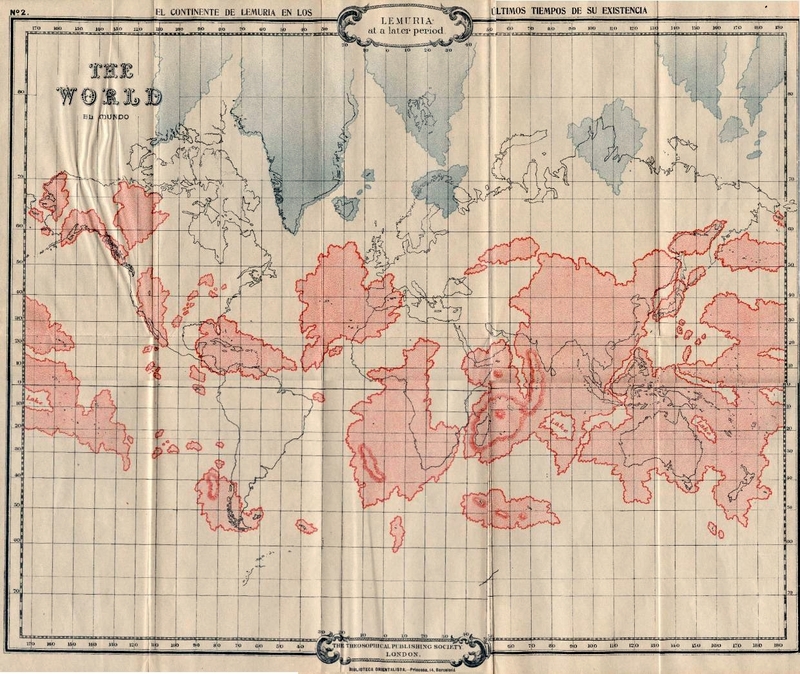 Even though Churchward's map shows "Atlantis". He believed it was "Mu" and not "Atlantis" that was the creator of the Egyptian culture, because the Sun God of his continent was named "Ra". Once again the sources used by James Churchward, as claimed by Helena Blavatsky, were Tibetan writings found in India when he was a British soldier. Which brings up the question for followers of both Blavatsky and Churchward. IF writings in Tibet told of all three Continents in some way?. How old and advanced over "Atlantis", "Lemuria" and "Mu" were the Tibetan Monks? 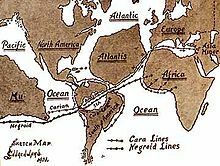 Also both Churchward and Le Plongeon claimed that a civilization called the "Naacal's"lived on "Mu". It reached 64 million people before the continent was destroyed,. Churchward went so far as to claim a Priest in India taught him the language of the "Naacal's" and helped him to read their texts. 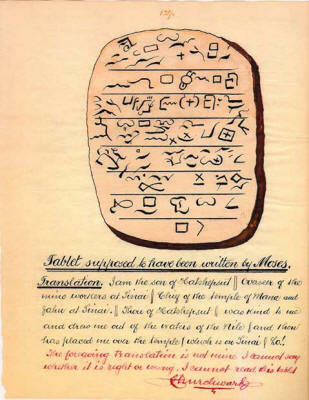 Below is a link to a picture of one of the "Naacal" tablets James Churchward claimed to have translated. Professor Masaaki Kimura, at this time, a member of the faculty of the University of the Ryukus on the island of Okinawa, Japan. Believes that the "Yonaguni Monument" are man made. Those ruins are found under the sea off the coast of the northern most Japanese island "Yonaguni". Professor Kimura holds the position that these are ruins of "Mu". His position is disputed, but my reader needs to take a good look at the following three photos of the "Yonaguni Monument". On February 23, 1935 Mascot Pictures released the first Hollywood look at "Mu" in a 12 part Chapter Serial entitled "The Phantom Empire". The continent of "Mu" was struck with disaster thousands of years before and the survivors escaped and created the underground country of "Murania" ruled by the evil "Queen Tika". She is played by actress Dorothy Christy. Who over her career acted with Will Rodgers, Buster Keaton, Laurel and Hardy, and the Marx Brothers. "Murania" plans to rule the surface world, but one man stands in "Queen Tika's" way. He is the owner of "Radio Ranch" which is located above the underground country. That ranch owner's name is "Gene Autry" portrayed by the real Gene Autry. 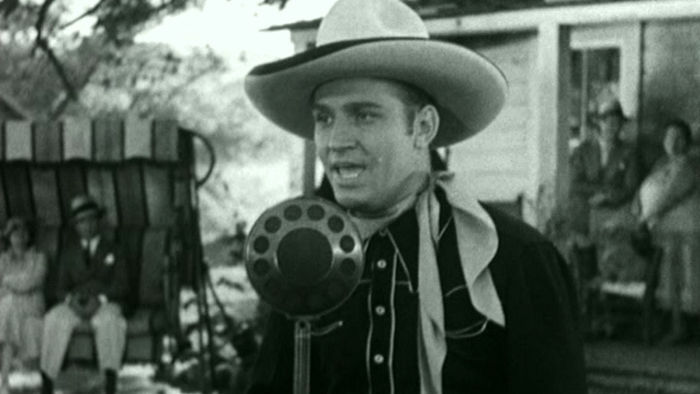 The character of "Gene Autry" is the star of the Country Western radio program "Radio Ranch" that broadcasts daily at 2 PM. This isn't a far stretch as the real Gene Autry had a Monday through Friday real radio program at the time called "Radio Ranch". 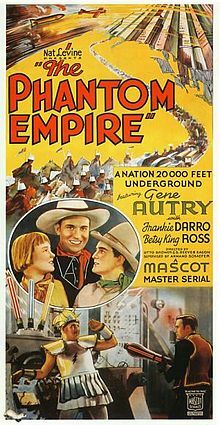 The merging of the real and fictional Gene Autry was smart screen writing for "The Phantom Empire". Which was also Gene's first on screen appearance. Not only does the fictional "Gene Autry" have problems from "Queen Tika" below ground, but there's J. Frank Glendon as the evil "Professor Beeton" above ground. "Beeton" is looking for a radium mine on the ranch. Add that IF fictional "Gene" does not perform his radio program at 2 PM. The bank will foreclose on his ranch's mortgage. "Radio Ranch" is also a working dude ranch for poor kids as a way to escape their daily lives during the depression. Should my reader be looking at both of the above posters. You will note the Gene Autry's co-stars are Frankie Darrow and Betsy King Ross. They play brother and sister "Frankie Baxter" and "Betsy Baxter". Frankie Darrow started in silent movies and became the voice of "Lampwick" in Walt Disney's "Pinocchio". "Lampwick" was the first of his many voice roles in animation. He was one of the "Bowery Boys" in the popular series that was a spin off of "The Eastside Kids". 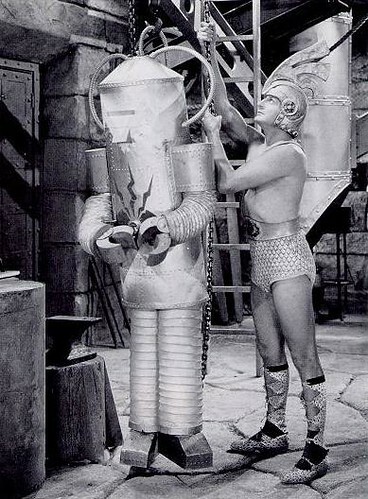 You might not recognize Frankie Darrow in 1956's "Forbidden Planet", but that's because he played "Robby the Robot". Betsy King Ross was given her role, because at the time of this production. She was the "Junior World Champion Women's Trick Rider" and was billed in the serial as such. 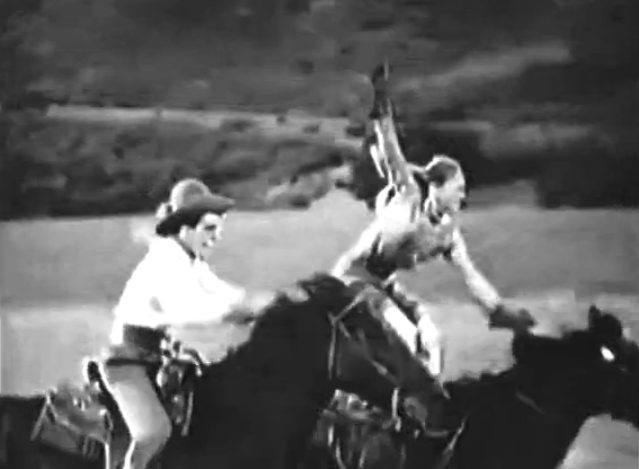 Both young actors did their own riding as Darrow was also a stunt man. Below Gene Autry and one of the robots of "The Phantom Empire". The robots seem to be wearing "Cowboy Hats", but that was just a coincidence. To save money Mascot Picture rented the robots from a prop company. They were first used in a Busby Berkeley musical number. So what did a typical Chapter of "The Phantom Empire" look like? "Gene Autry" confronts "Queen Tika" in "Murania". Meanwhile "Professor Beeton" and his henchmen are attempting to move radium from the old mine shaft as "Frankie" and "Betsy Baxter" spy upon them. The two then head back to "Radio Ranch" to tell "Gene". Who is still in "Murania" of their discovery. Out of the side of a mountain come the mysterious "Thunder Riders". They are actually "Queen Tika's" army causing problems and robbing food supplies. Yet, somehow everything comes together with "Gene Autry" and his group meeting his 2 PM broadcast. Got that? Will "Gene" stop "Queen Tika's" plans to conqueror the surface world? Will "Gene" stop "Professor Beeton's" plan to steal the radium and realize the sale of it will pay the mortgage on "Radio Ranch"? Will "Gene" be able to perform on his radio show while being trapped in "Murania"? These and other questions are answered in Chapter 12 "The End of Murania". Let's get one thing straight. 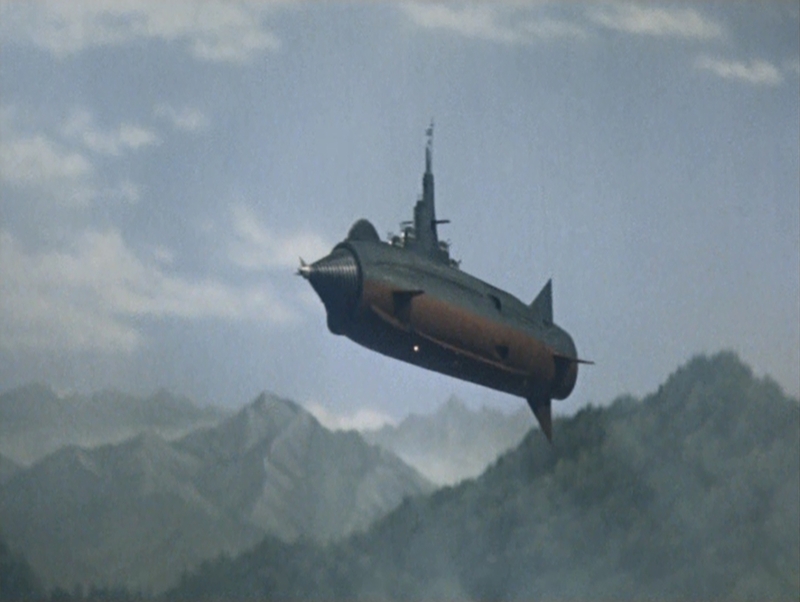 The "Undersea Warship" of Toho Studio's "Kaitei Gunken (A Submarine Warship)" is not "Atragon". The title of American International Pictures re-edit and dubbing of the Japanese feature film, but the "Gotengo". The original Japanese language version of the motion picture was released on December 22, 1963. The AIP cut wasn't released until March 11, 1965. 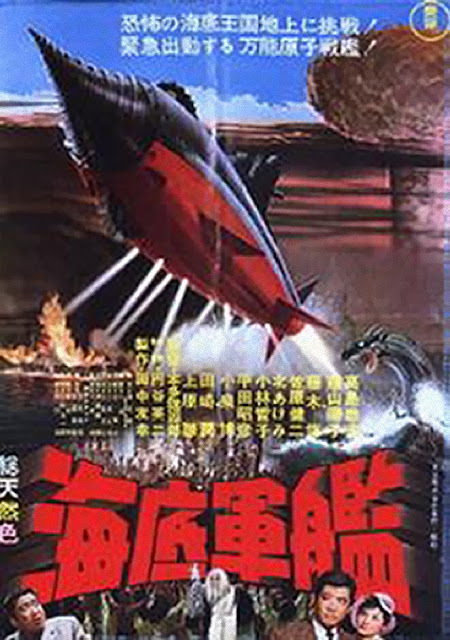 This is Toho Studio's classic based upon "The Undersea Warship" by Japanese Science Fiction Pioneer writer Shunro Oshikawa and "The Undersea Kingdom" by Shigeru Komatsuzaki. Komatsuzaki was also the conceptual artist for this feature and Toho's "Matango" the same year. In which he designed the costumes of the Mushroom people. 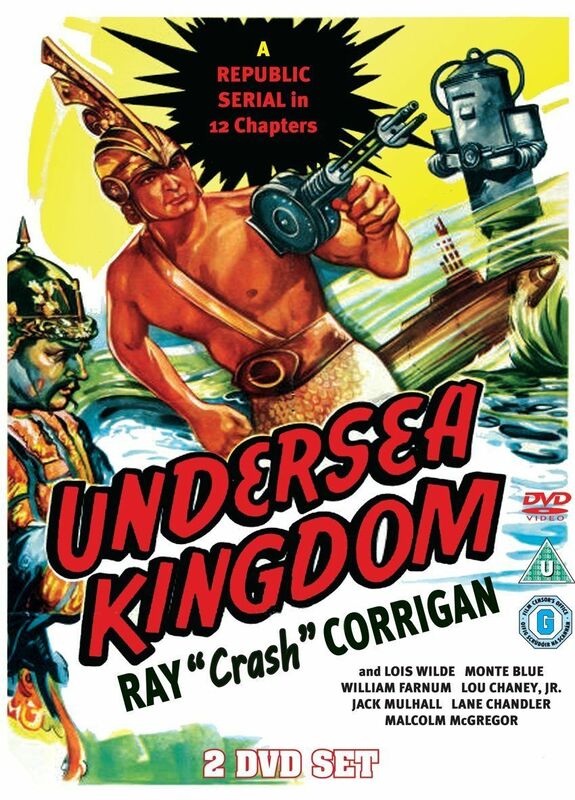 "Undersea Warship"is directed by one time cameraman for Akira Kurosawa, Ishiro Honda, the dean of Japanese Science Fiction of the 1950's and 1960's. Starting with 1954's "Gojira" the original Japanese version of "Godzilla" and the over looked "Mountain Snowman" the following year. 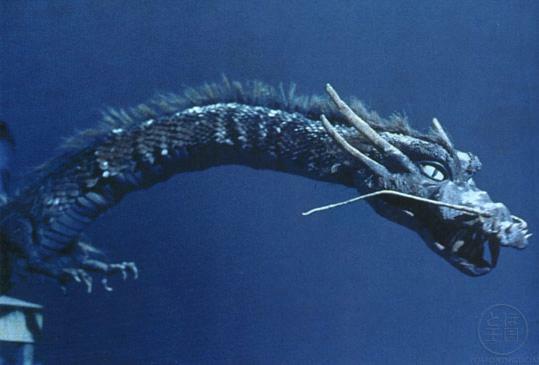 The special effects are the work of the great Eiji Tsuburaya. One of the predominant artists in his field World wide. Tsuburaya is remembered for creating the monsters of Toho's Science Fiction and Horror, but he was also the first person to bring the attack on Pearl Harbor to life on the screen.with 1942's "The War At Sea From Hawaii to Malaya". 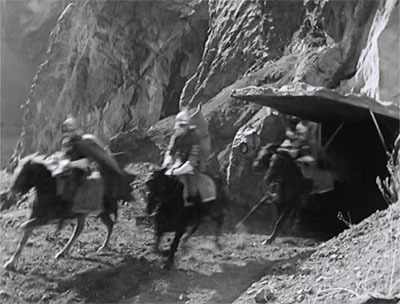 A film Commander John Ford believed contained actual Japanese footage of the attack. His effects work was that good. "Undersea Warship" is about "Empress Mu", Tetsuko Kobayashi, who wants to conquer the surface world of 1963 Japan. Two photographers are filming with a model one night. When they see a car drive off the edge of the pier into the ocean with two men in it. Additionally the photographers and their model observe a man in a strange diving costume surface by the pier and they take a picture of him. These events are immediately reported to the police. but when the car is brought to the surface it is empty. One of the two photographers "Susumu Hatanaka", Tado Takashima, spots a beautiful girl he wants to photograph while he is being interviewed by the police. Tado Takashima who had starred in "King Kong vs Godzilla" and would also be seen in "Frankenstein Conquerors the World" and its sequel the "War of the Gargantuas" is on the far right of the following still. 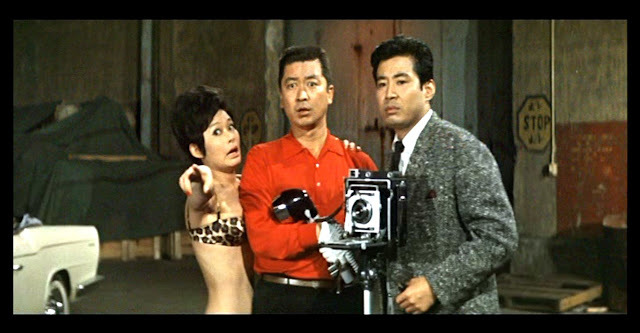 The girl he wants to photograph turns out to be "Makoto Jinguji" played by Yoko Fujiyama. "Makoto" is the daughter of a Japanese Naval Officer who disappeared with his submarine at the end of World War 2. Two years after this picture Fujiyama would appear in Akira Kurosawa's classic "Red Beard" starring Toshiro Mifune. She also appeared in the Science Fiction film "Dogora". 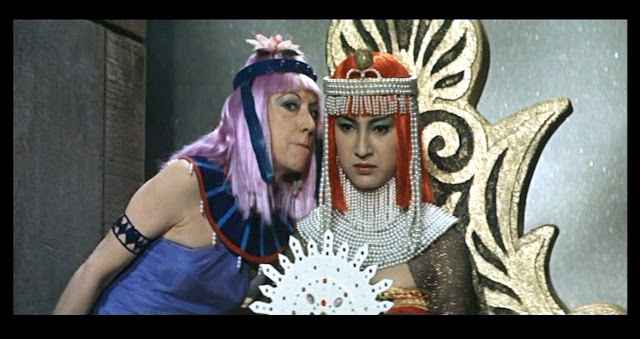 Two very recognizable faces for fans of Toho Studios Science Fiction are also in this production. The first face portrays "Mu Agent #23" and that is Akihiko Hirata. 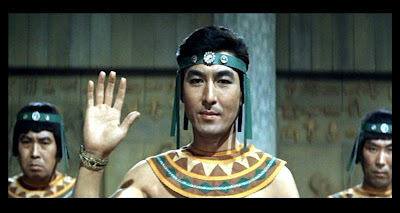 Hirata has gained World wide Science Fiction immortality for portraying "Dr. Daisuke Serizawa" in the original 1954 'Gojira:. Just a small mention of his other Science Fiction/Horror work are the following titles: "Rodan", "The Mysterians", "The H-Man", "Varan, the Unbelievable", "Mothra", "Gorath", "King Kong vs Godzilla" and "Latitude Zero". I would also add the excellent story of the Japanese Navy during World War 2 from Pearl Harbor to Midway. Known mostly as either "Storm Over the Pacific" the American edit "I Bombed Pearl Harbor". This 1960 war film from the Japanese perspective has special effects by Eiji Tsuburaya. "Agent #23" was first seen driving the car off the pier and reappears throughout the film. "Makoto" is being followed by two men. One is an agent of the "Empress of Mu" and the other a member of her father's missing submarine crew. It will be revealed that her father is still alive and has built the "Gotengo", or "Atragon" if my reader prefers. "Captain Hachiro Jinguji" is portrayed by Jun Tazaki. Tazaki is known for director Teinosuke Kinugasa's excellent 1953 "Gate of Hell", Hiroshi Inagaki's "Chushingura (The Loyal 47 Ronin)" in 1962 and Akira Kurosawa's classic retelling of "King Lear" titled "Ran" in 1985. However, fans of Toho Science Fiction know Jun Tazaki for among many others films: "King Kong vs Godzilla", "Mothra vs Godzilla (aka: Godzilla vs the Thing)", "Invasion of the Astro-Monster" and "Destroy All Monsters" . A favorite film of mine has Jun Tazaki in "The Lost World of Sinbad" starring Toshiro Mifune and he was featured with Mifune and Hirata in "Storm Over the Pacific". "Captain Jinguji" has built his "Gotengo" to restore Japan's honor. It will take some convincing to get him to fight "Mu", but it will happen. The American International version has some major editing and dialogue changes. This is to remove the political talk about the Second World War and especially on "Captain Jinguji's"reasons for wanting to use the 'Gotengo" to restore Imperial Japan's place in the World. A still touchy situation even as late as 1965 in the United States. Once engaged in battle with "Mu" the ships crew must also fight their God "Manda". On December 18, 1995 Toho Studio released a new version of Shunro Oshikawa's novel. 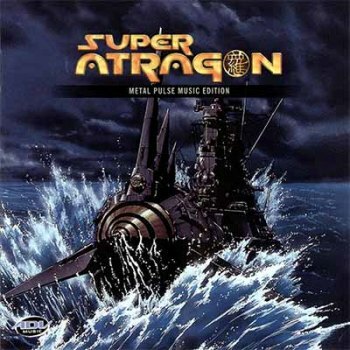 This was the animated "Shin kaitei gunkan" known in English as "Super Atragon". The story starts in 1930 with a meteor hitting the earth bringing an unknown type of metal. Switch to World War Two and two super submarines one for the Americans called the "Liberty" and the other for the Japanese called the "Ra". You have two women appear one named "Avatar" and the other "Annette". They are spies for the "Mu Empire" and are to observe how humanity is destroying itself and use the war as a prelude for the conquest of the surface. The meteor had actually been a test by "Mu" that went wrong. "Annette" decides to help save humanity and defects to the "Ra". "Avatar" decides to go to the Americans and use them to start "Mu's" war of conquest. The "Liberty" and the "Ra" meet in battle and destroy each other causing both "Annette" and "Avatar" to go into suspended animation. Cut to 50 years later and a young man who believes his father died with his submarine during World War 2. He discovers his father is still alive and has rebuilt the "Ra". The young man becomes a member of the crew and falls in love with a beautiful girl. Actually it is "Annette" with her secret of being decades old. When "Avatar" also reappears to carry out the conquest of the surface with the "Liberty". The battle between the two women resumes. Back on March 21, 1970 "Mu" attacked Japan once again. When the sixth children's film in the Showa "Gamera" series was released. "Gamera tai Daimaju Jaiga (Gamera vs Giant Devil Beast Jiger) has Japan preparing for "Expo '70" to be held in Osaka. During the excavation on an island an ancient statue is discovered. The authorities are warned not to remove it, because of a curse and something called "Jiger". Of course they remove it. As a result "Jiger" appears to destroy Japan and the statue, because it contains a sound that keeps the monster prisoner. 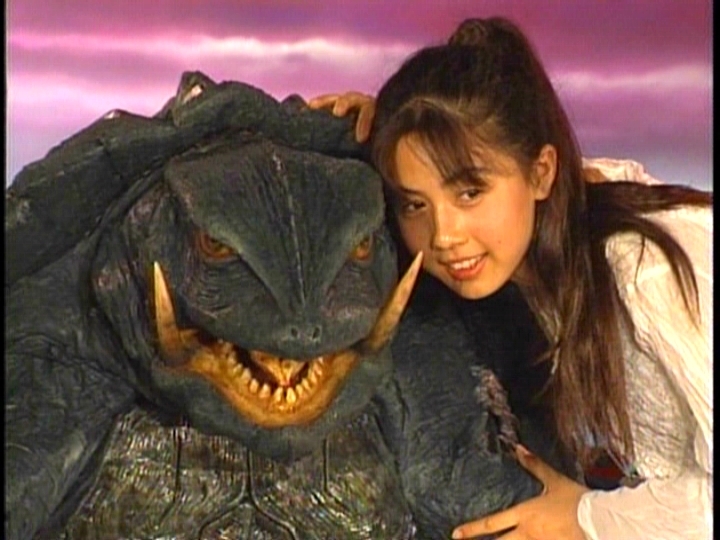 The Giant Kid Friend Turtle "Gamera" defends Osaka against it. 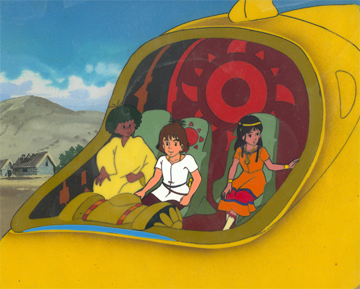 Between June 22, 1982 and March 22, 1983 there was a French and Japanese animated series. Depending upon which country you were viewing it in. 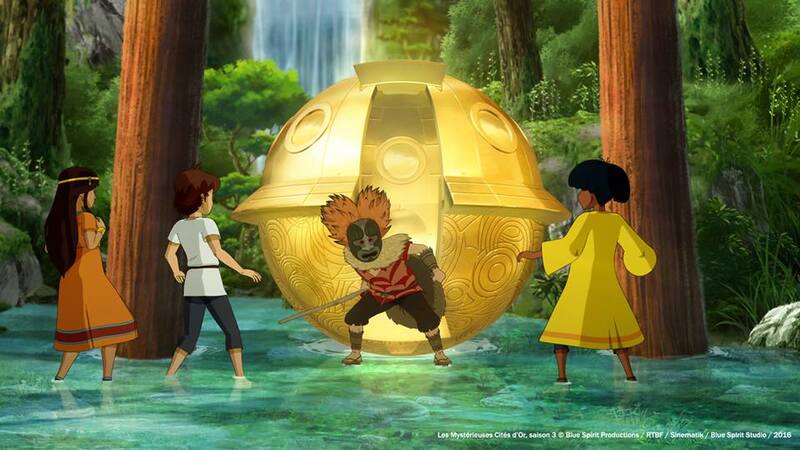 The title was either "Taiyo no Ko Esteban (Esteban, Child of the Sun)", or "Les Mysterieuses Cities d'or (The Mysterious Cities of Gold)". In 1532 a Spanish Orphan named "Esteban" joins a search for the fabled "Seven Cities of Gold". During his adventures the audience sees Mayan, Inca and Olmec civilizations, but also meets that last survivor of the "Lost Continent of Mu".. In the non-English language versions his name is "Tao", but in the English dub he is now "Hiva". 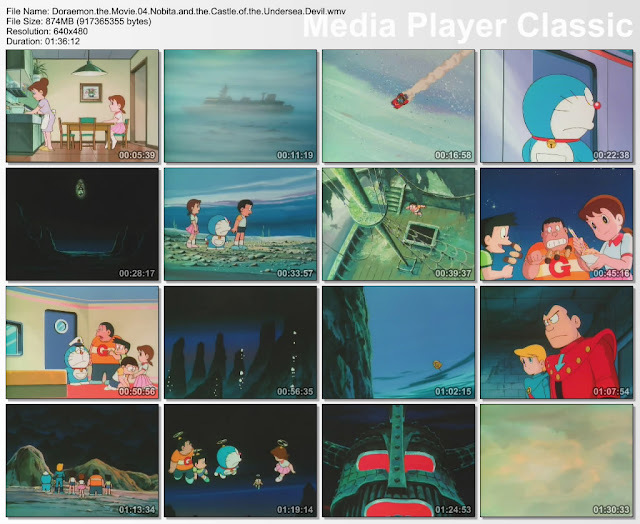 A blending of legends occurs with the Japanese childrens animated motion picture "Doraemon: Nobita no Kaiteiki Ganjo (Doraemon Nobita's Underwater Castle)" aka: "Doraemon: Nobita and the Castle of the Undersea Devil". The film was released in Japan on March 12, 1983. The plot for this adventure places both "Mu" and "Atlantis" in the Atlantic Ocean and specially within the "Bermuda Triangle". "Atlantis" is now controlled by Robots that want to conquer the Earth. "Doraemon" and others are looking for treasure in the triangle and their craft is damaged. They are rescued by people from "Mu" and join with them to stop the robots. 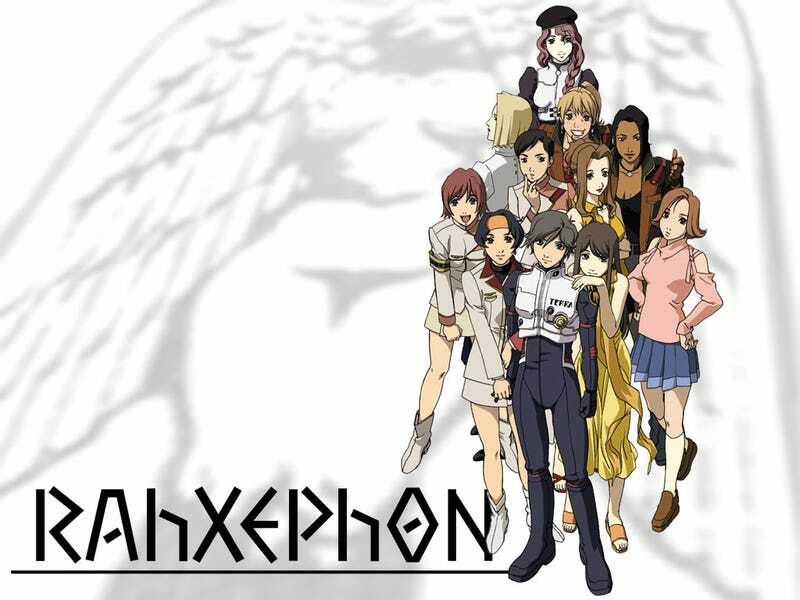 Between January 21, 2002 to September 11, 2002 was a Japanese anime series known in English as "RahXEPhon" and is the last entry about "Mu" I will look at. 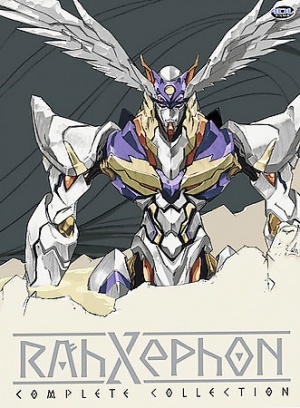 Depending on who translates the original Japanese title "ラーゼフォン" it could also be either "Lasephon", or "Razefon". Part of the plot is taken from James Churchward's writings on "Mu". The Earth is invaded by multi-dimension beings called the "Mulians". Who are called simply the "Mu". These invaders look like normal humans except that they carry a genetic marker called the "Mu Phase". This marker turns their blood blue, It is the year 2012 and two floating cities appear over Tokyo and Sendai. The story has an ordinary school boy named "Kamina Ayato" living a very ordinary life, but he gets caught up the chaos when the invasions by giant machines called the "Dolem" begins. "Kamina" meets a young girl named "Mishima Reika" and suddenly he knows a lot about a giant human being called the "RahXEPhon". Who has the power to stop the "Dolem". WHY? Did "Atlantis", "Lemuria" and "Mu" exist, or some other central continent? We know as fact that there was some great flood, or other natural catastrophe that effected the planet and changed the positions of the known continents. Could there have been larger land masses that touched each other? We know that Russia and Alaska were connected in the past, but superior intelligent beings in another question. Answerable through Science Fiction rather than agree facts, but what about the "Yonaguni Monument"? Fact, or fiction? There are similar seemingly man made ruins of New Zealand. My reader can decide and that was not the purpose of this blog article.